If you had ever traveled to Singapore, or even lived in Singapore, you would probably have missed seeing most of what I'm about to show here. 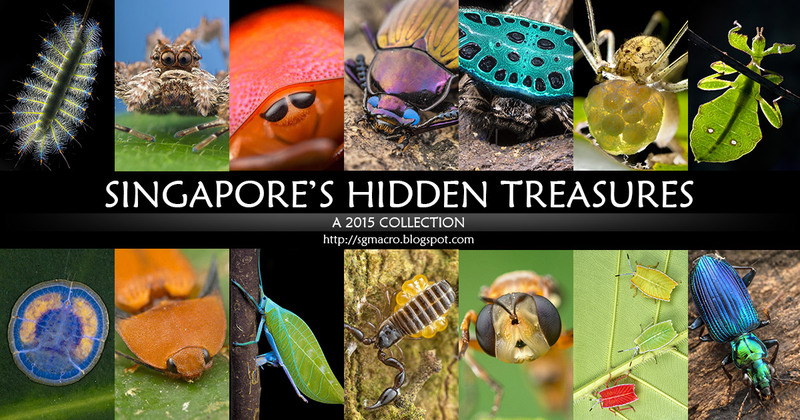 This is a collection of some of the memorable photographs that I've taken of the tiny creatures in Singapore in 2015 (not necessarily the best shots). 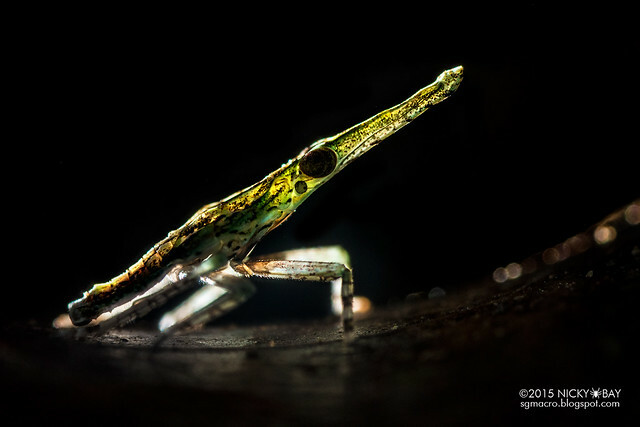 I do have many more shots of bizarre creatures from the past years, so you could check out my 2012, 2013 and 2014 collections if you enjoyed this post. 2015 is the year when I took a break from my full-time job and did a lot more macro trips. 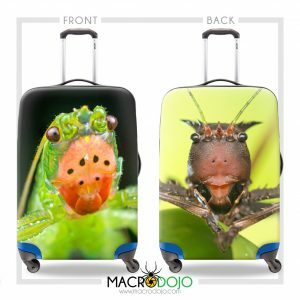 On top of 1 or 2 weekly field trips, I did the world's first review of the 1:1 wide angle macro lens, started Borneo Bootcamp and co-instructored in BugShot Belize, and traveled across the globe to explore the Peruvian Amazon. 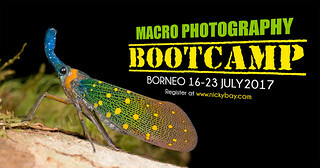 I would like to take this opportunity to thank my macro photography buddies who have ventured the trails with me every week, inspiring us with non-stop innovation to their equipment, and selflessly sharing whatever they found, ensuring that everyone got their shots. Thanks Melvyn, Victor, David, Chris, James, Seawei and Andrew -- all these photos would not have been possible without you all. Cheers! p/s: Some rare and flamboyant subjects that I shot in Singapore this year have been omitted from this list intentionally to prevent overcrowding/intrusion to their habitat. I might share some time in the future instead. 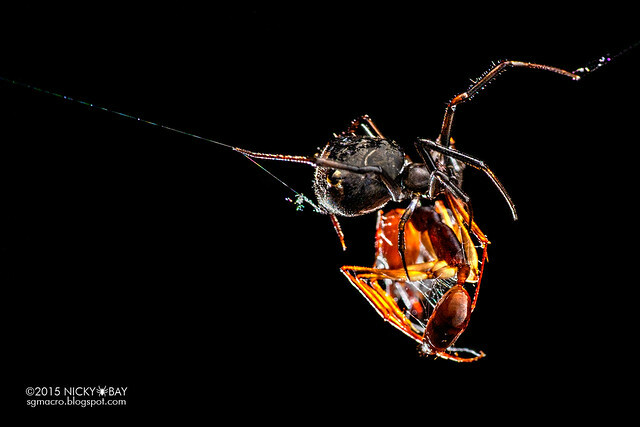 A vulnerable moment as the orb weaver makes its final push out of its exoskeleton. 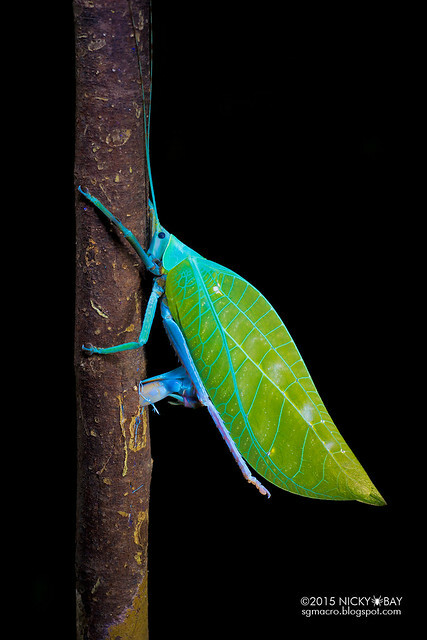 The legs appear in a fresh tone of green at this moment, and turns brown shortly after it emerges fully. 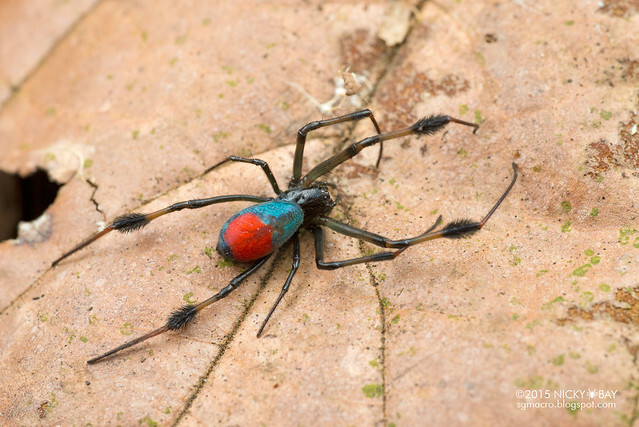 This spider is currently placed as Singa perpolita but is likely to be transferred to Araneus. 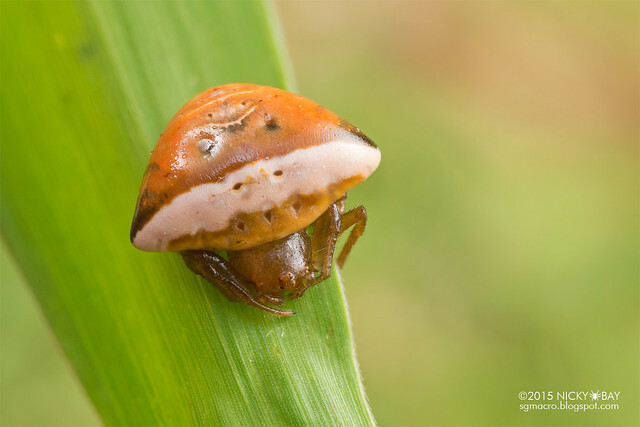 The trashline stabilimentum of Cyclosa is typically just a single line, but this was my first encounter with expanding stabilimentum in multiple directions in the central catchment reserve. 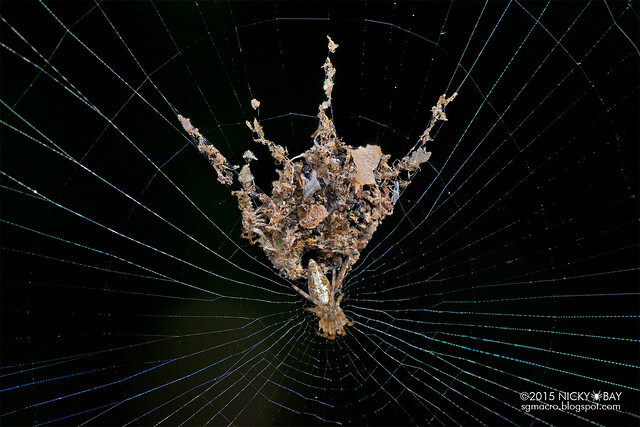 Read the earlier article: Spider Creates Fake Spider Using Trash. A surprise find when checking out an urban park in the east. I found 3 of them in the same area! 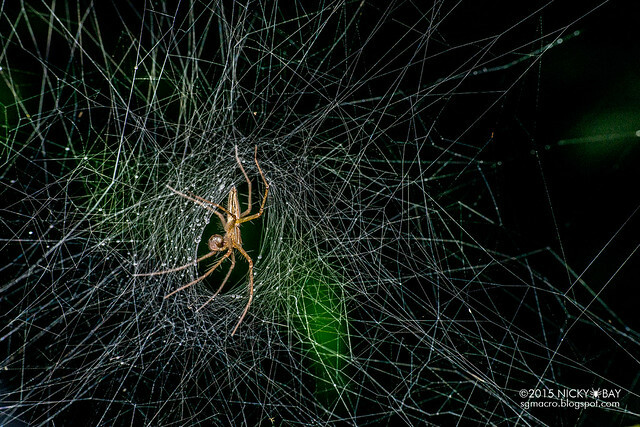 A very common spider in Singapore, but rarely photographed in full within its web. 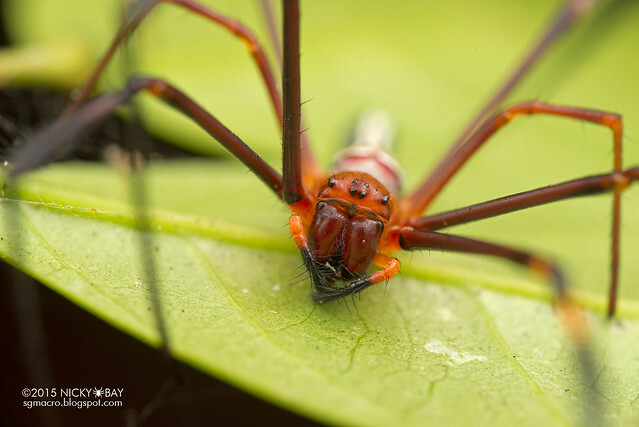 The red tent spider weaves a large 3-dimensional web and positions a dead leaf in the middle of the web where it hides underneath, coming out only to collect any trapped prey. 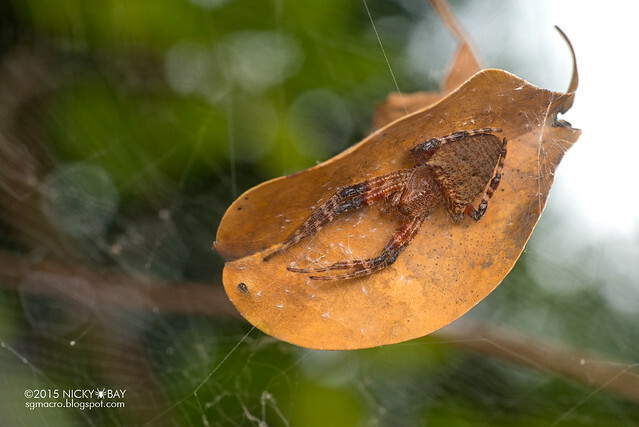 A master of camouflage, this orb weaver is able to wrap itself around most branches to appear like a part of it. 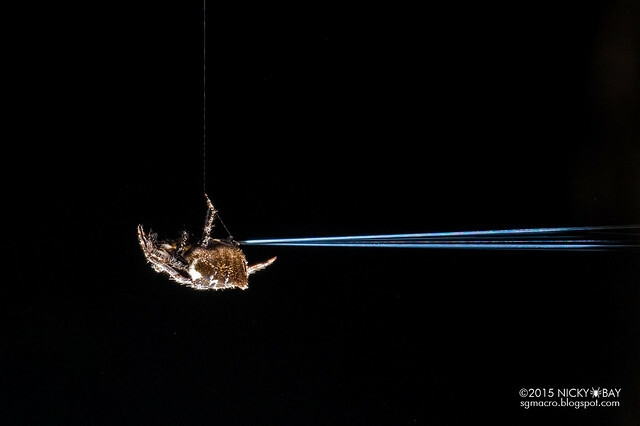 A goal that I have for the following year is to take a good shot of the silk being spun from an orb weaver. This is what I had from a night's attempt. Hope to do better! 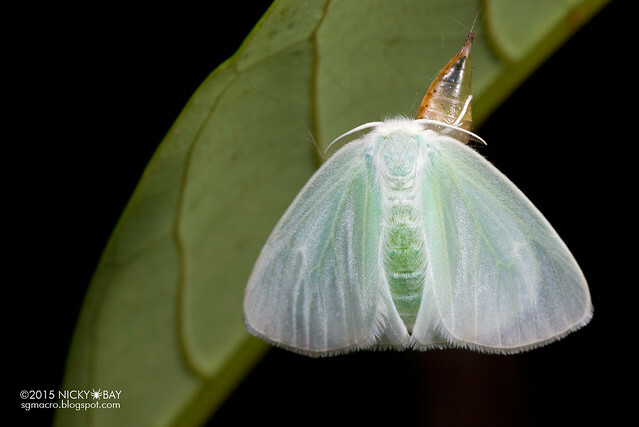 A stunning species usually found weaving silk above our heads as they grow bigger. Despite the seemingly strong spines, please refrain from handling it with your hand as I've seen specimens with broken spines before. 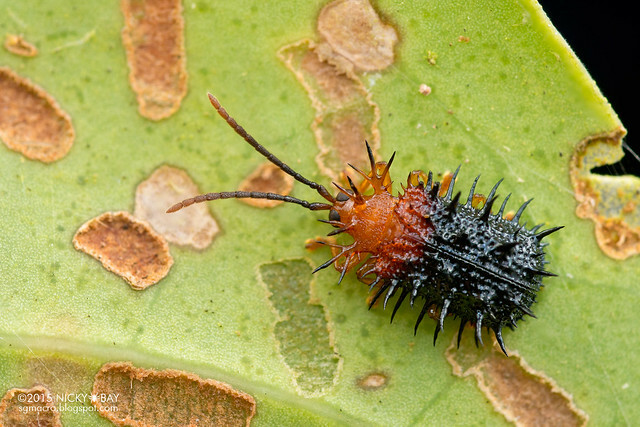 Similar to the Gasteracantha above but with posterior spines absent and longer median spines. 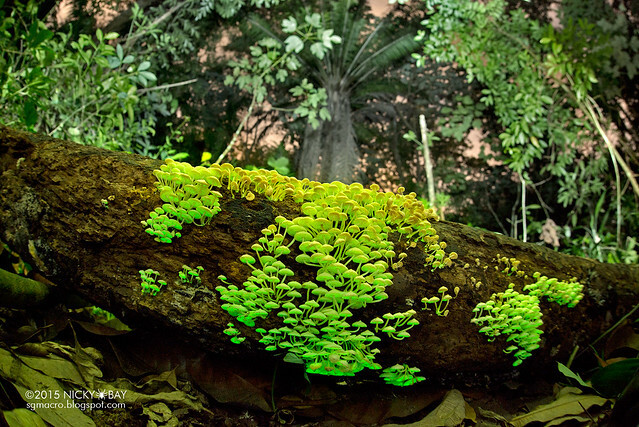 The enchanting fluorescence is a result of exposure to ultraviolet light. 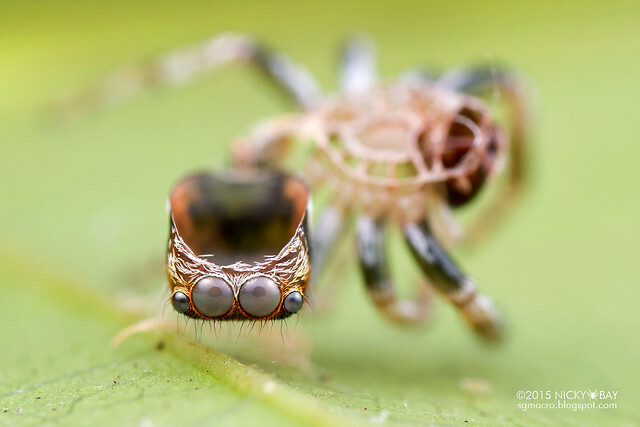 This spider is famed for its majestic stabilimentum and I have been searching for a fully woven web for years. This is just a partial stabilimentum and I really hope to see the complete one soon! 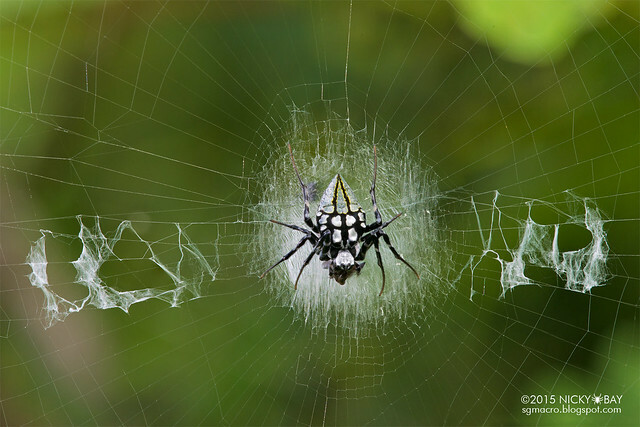 Look closer, and you would notice that she has a suitor waiting on the other side of the orb web! 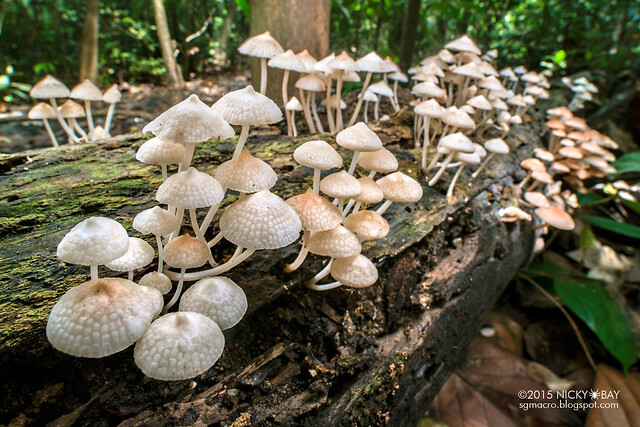 When all we see are common subjects, we had to think of different ways to photograph them. 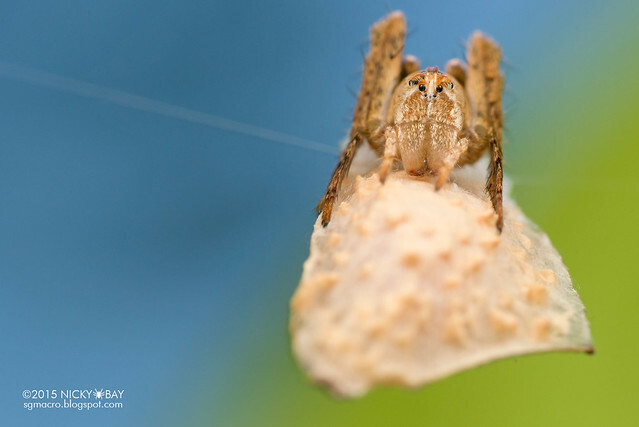 Blasting light through this sac spider hiding underneath a sheet of silk reveals the spider's outline and even the coxa within the cephalothorax! 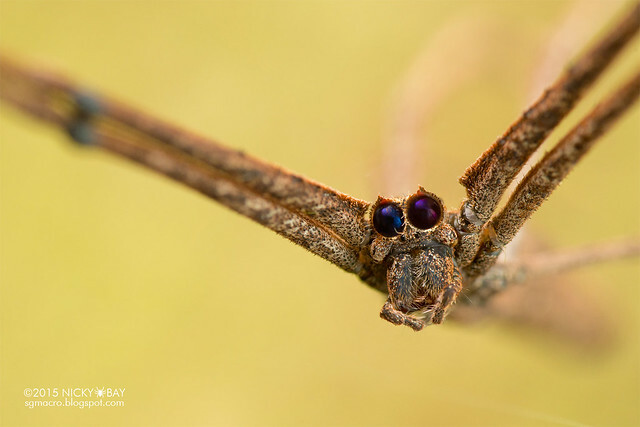 Classic ogre-face shot of the net-casting spider - the huge anterior median eyes allow it to easily detect prey movement. Really difficult to get a shot of it with the net, as it would normally be facing a leaf beneath it. This pair appeared to be engaging in courtship, so I didn't go too close to disrupt their night. 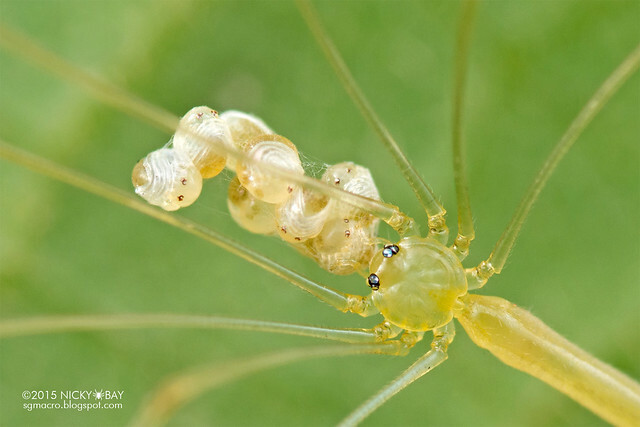 Their elongated spinnerets can do an awesome job of wrapping up prey in a matter of seconds! First time seeing the pirate with prey! 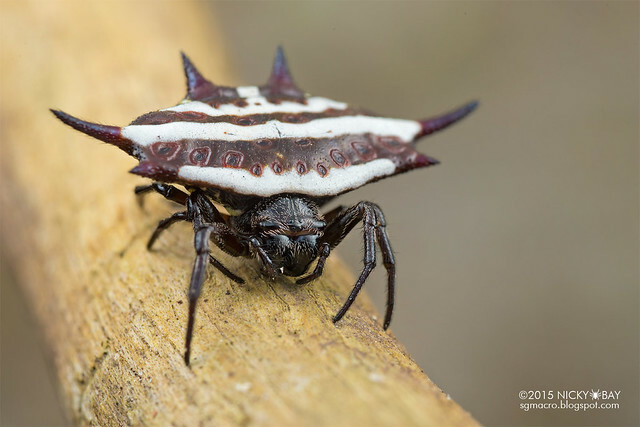 The pirate spider is known to attack other spiders with a hunting pattern similar to that of Portia, but we've yet to see it in action. This is the closest we've got! 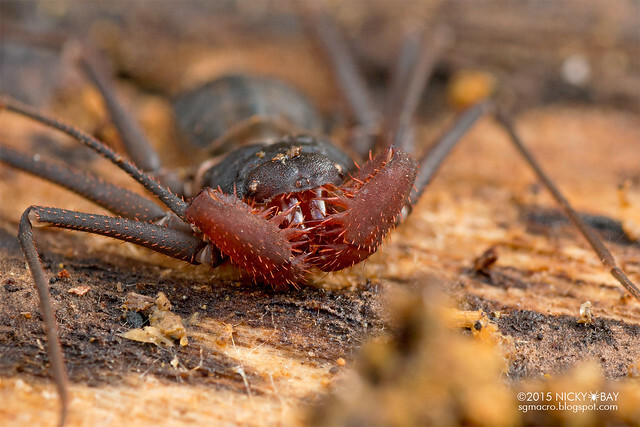 Often called "tube trapdoor spider" but I've never seen it build any trapdoor at their burrows. 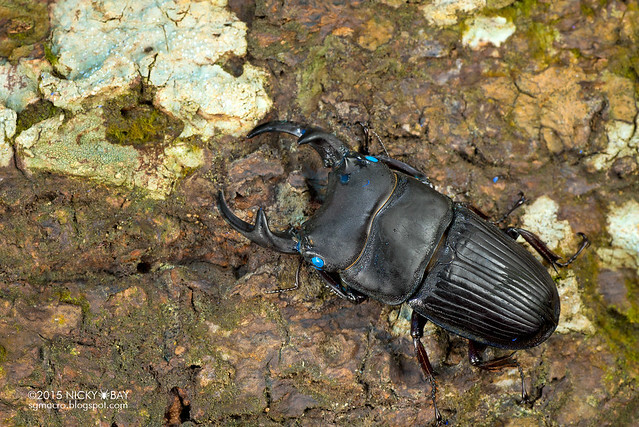 This is a mature male wandering around in search of a mate, illuminated with ultraviolet. 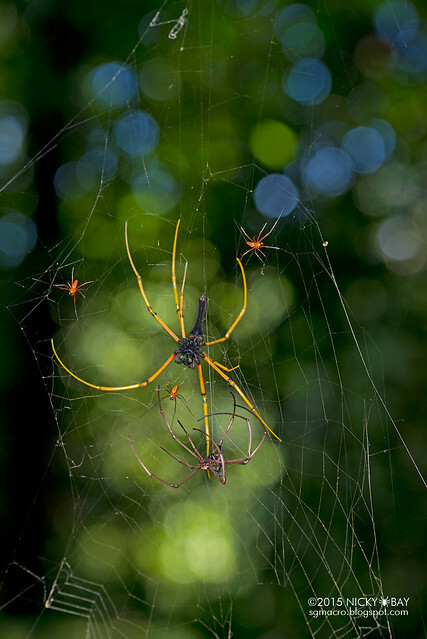 Typical scene of a female golden orb weaver emerging from her moult, with multiple males waiting for an opportunity to mate while the female is in her vulnerable state. 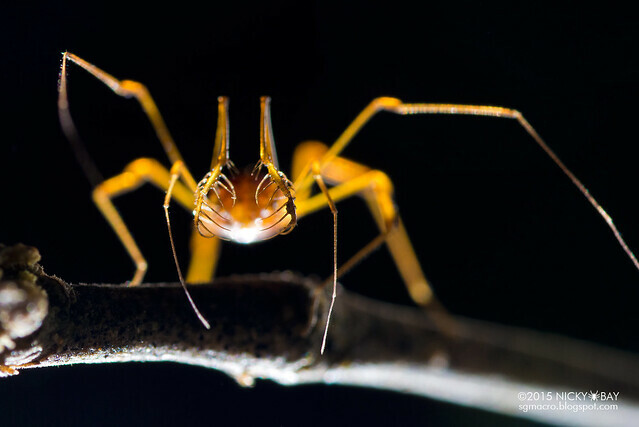 A relatively young female golden orb weaver resting under a leaf as her web had been destroyed by the torrential rain. When she matures, the carapace would bear a much darker colour. 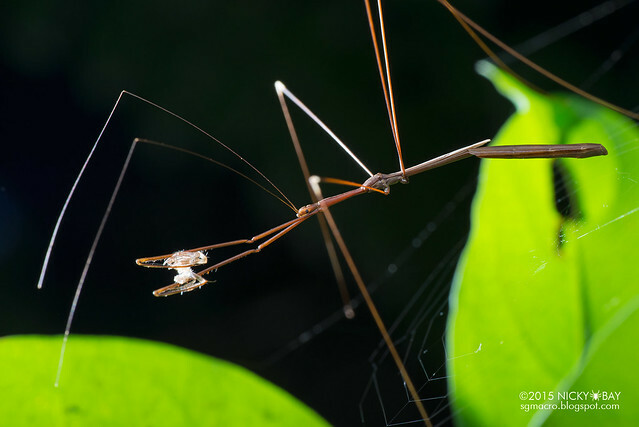 Looks like any daddy-long-legs spider? 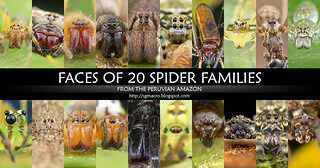 This family of spiders has spectacular purple iridescence on the legs! Classic example that I would use to illustrate a bright, colourful background to complement the subject. 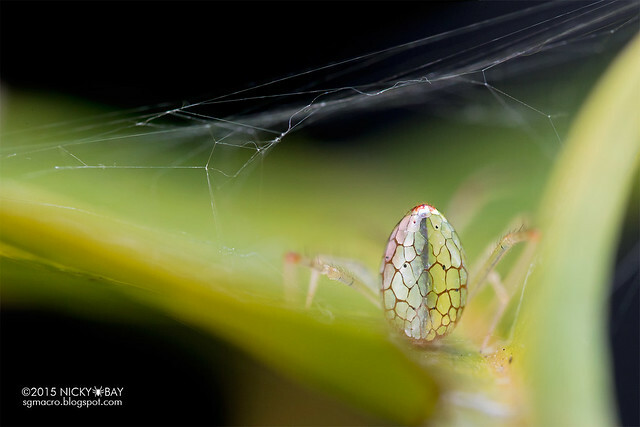 This spider typically suspends her egg sac on a single strand of silk beneath leaves. The patterns on this lynx were incredibly striking. It was a really tiny but stood still enough for us to get decent shots. 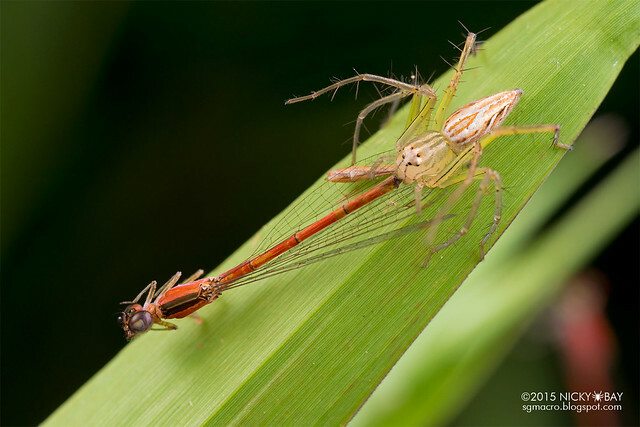 Damselflies are known to be quick and voracious hunters, so it is pretty rare to see a young lynx taking on a damselfly. 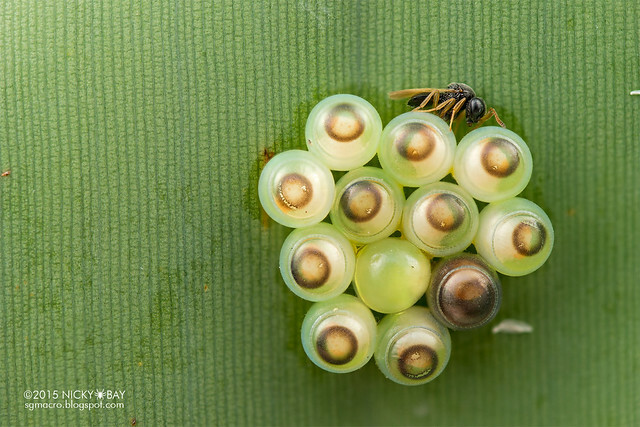 Just before hatching, we could see the spiderling eyes and legs on the surface of the eggs. Very common spider, but observing the mature male up close would reveal a pair of eye stalks and little thorns at the tip! 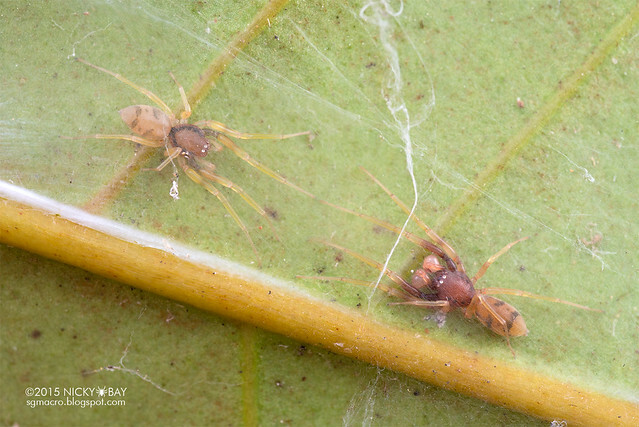 Clusters of pholcid spiderlings always look awesome due to the length of their legs. This is the typical nursery web of a pisaurid. 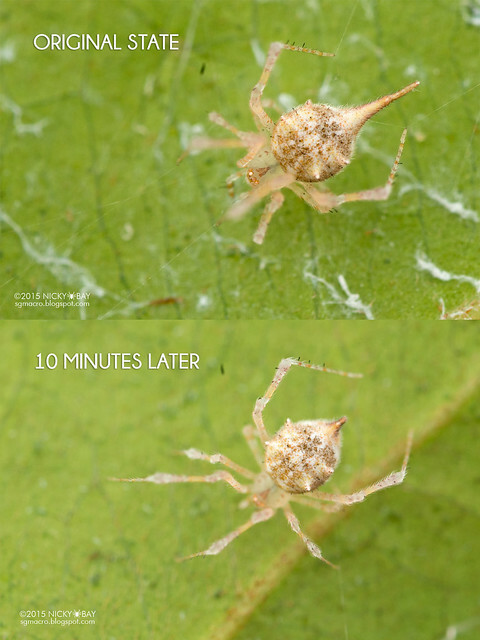 Might be mistaken for a lynx spider at times, but those are roving hunters and won't weave such webs! 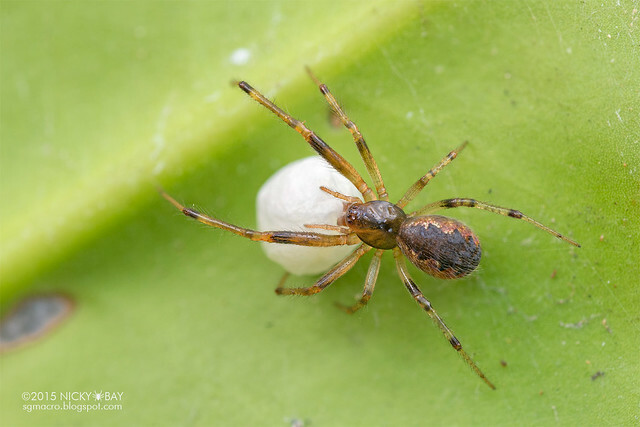 Spiders in this genus hide in rolled leaves positioned in the middle of their orb web. 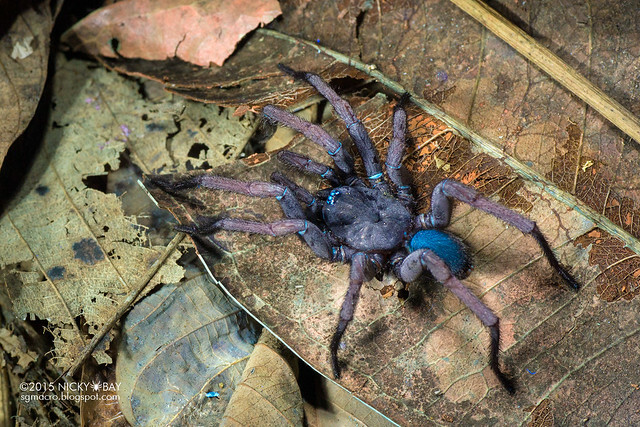 It has characteristically long and hairy legs that can cover its entire body when at rest. 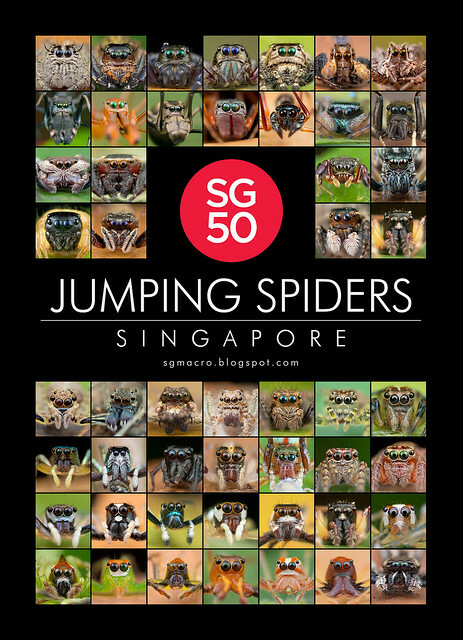 In celebration of the nation's 50th birthday and with all the SG50 hullabaloo going around, I did an SG50 commemorative poster featuring 50 jumping spider portraits of Singapore. You can still purchase the poster here. 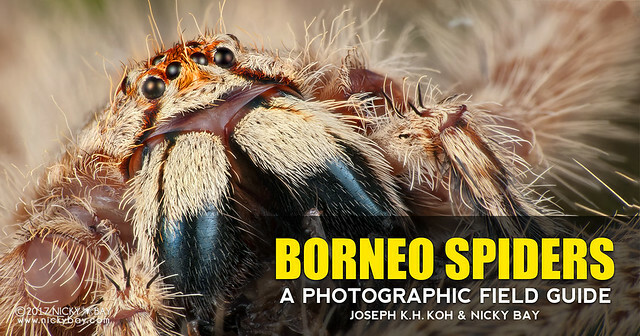 One of the most common jumping spiders in Singapore. This is a scene of potential courtship with the male on the left, and female on the right. 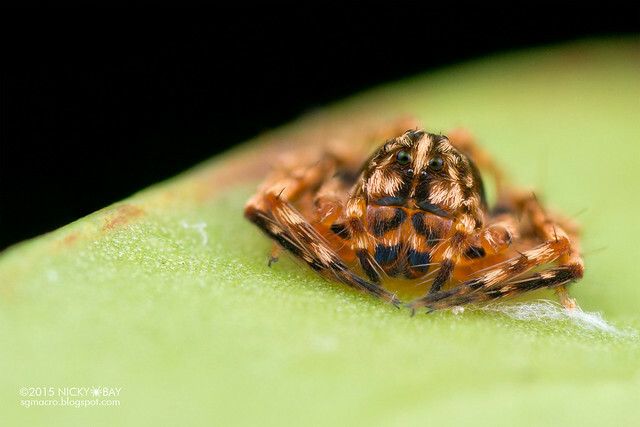 Seen several salticid pairs on the same leaf before, but never seen them in action. Wonder why? 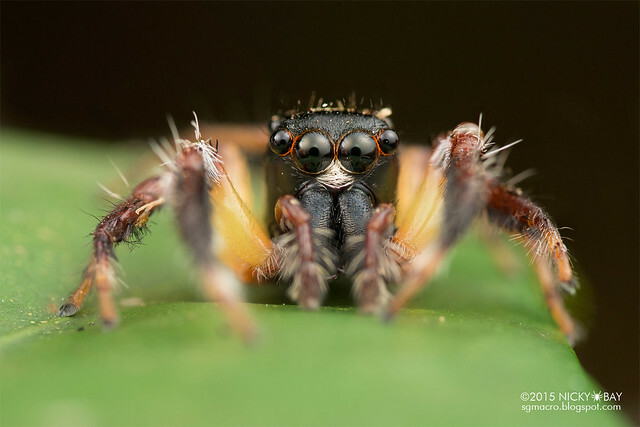 This large salticid has exceptionally long, straight chelicerae. 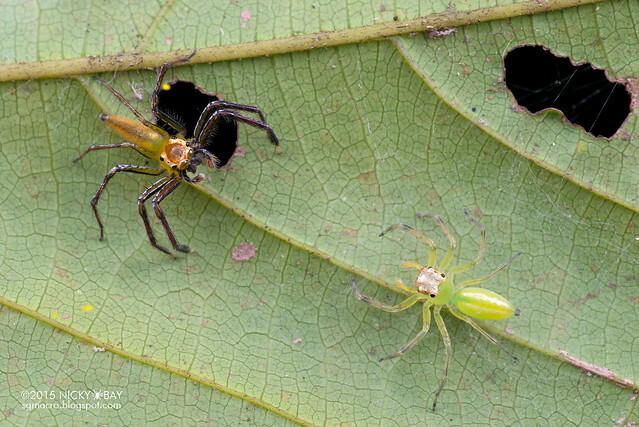 This salticid was helping a Nephila to clear out the kleptoparasites on its web. 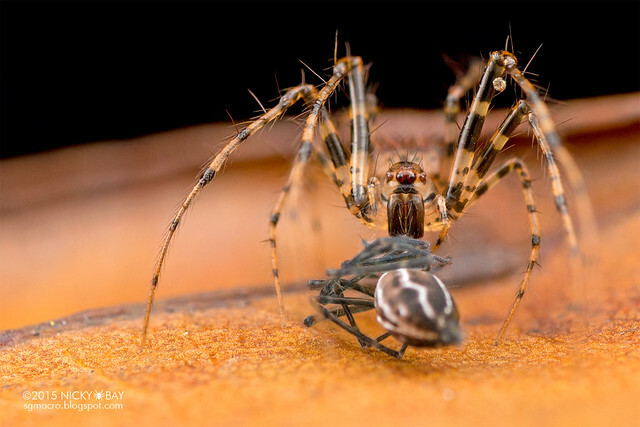 For those who don't know what's going on, the prey is a spider that steals food from the web of other spiders - most often seen on the webs of golden orb weavers. 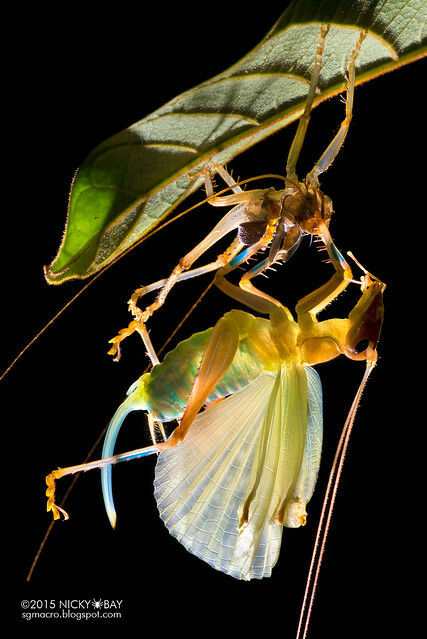 Amazing how exoskeletons can look so perfectly intact. 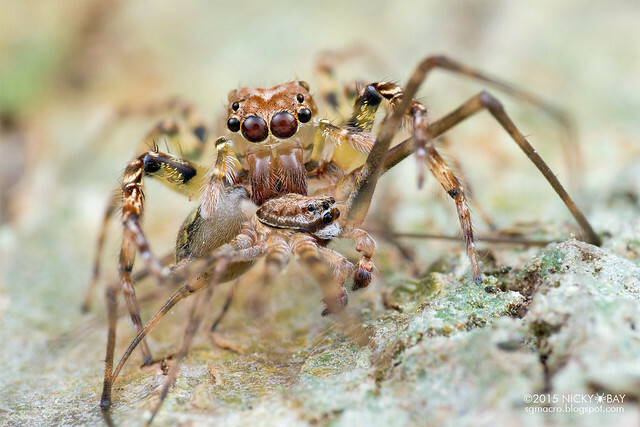 The male hersiliid was no match for the salticid! 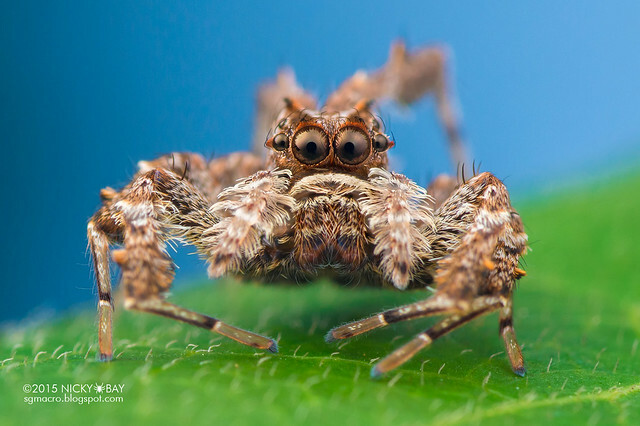 A curious looking Cosmophasis often known for its thick "eye brows". 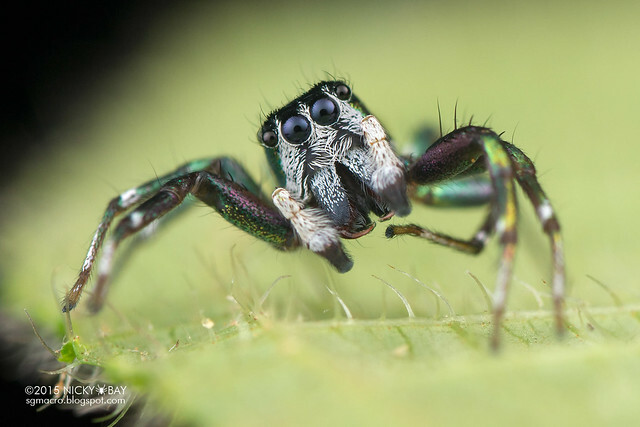 This ant-mimic salticid has beautiful green and blue scales on its legs and carapace, looks very different from Myrmarachne. 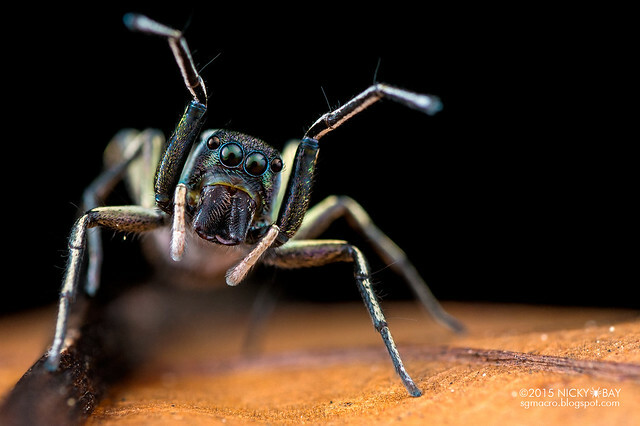 The famous spider hunter is an excellent subject for portraits, although the white-moustache will tend to over-expose. 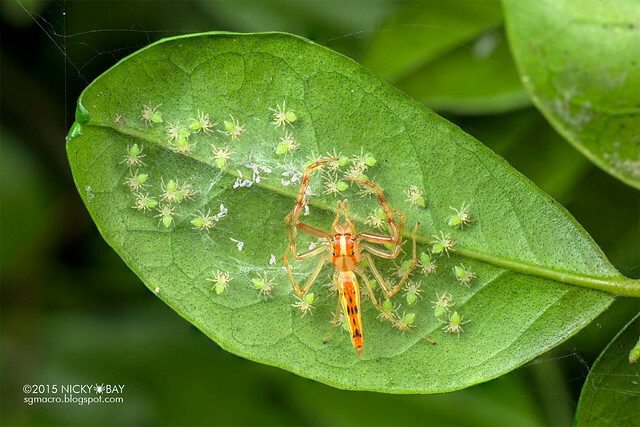 Adorable little family as the mother watches over her spiderlings. 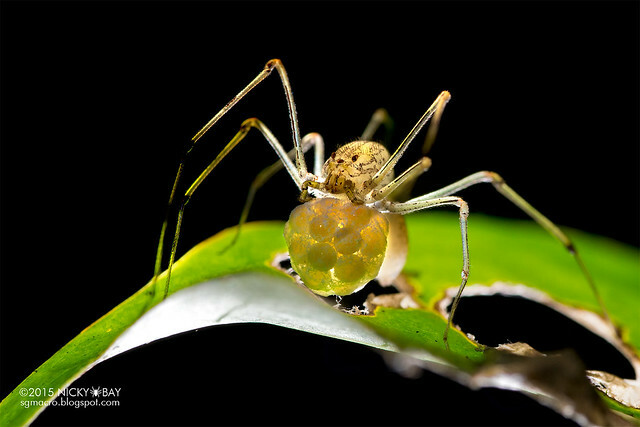 Lighting up this spitting spider from below allowed the eggs in the egg sac to show up, resulting in a captivating scene. 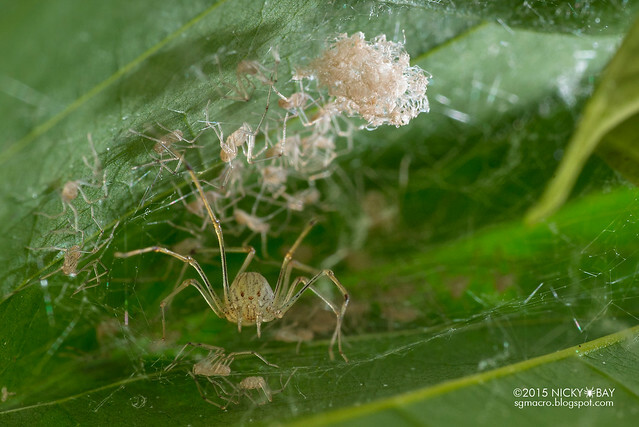 A slightly later stage with the spiderlings hatched and moulted, this scene depicts the mother oblivious to her scurrying babies. 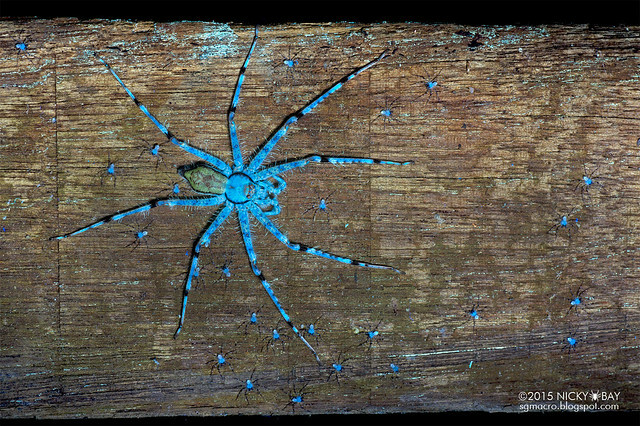 A "glittery" scene of fluorescing huntsman spiderlings surrounding their mother. 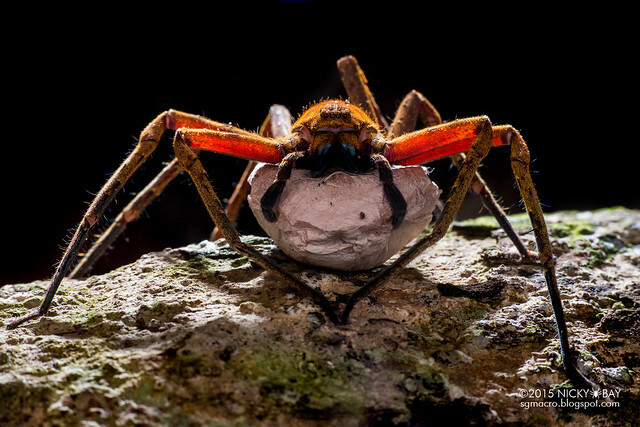 Lighted from behind, the large orange Heteropoda strikes an eerie mood while clutching onto her precious egg sac. Mixing in various lighting methods resulted in this surreal and brilliantly coloured scene of a rare Pandercetes. 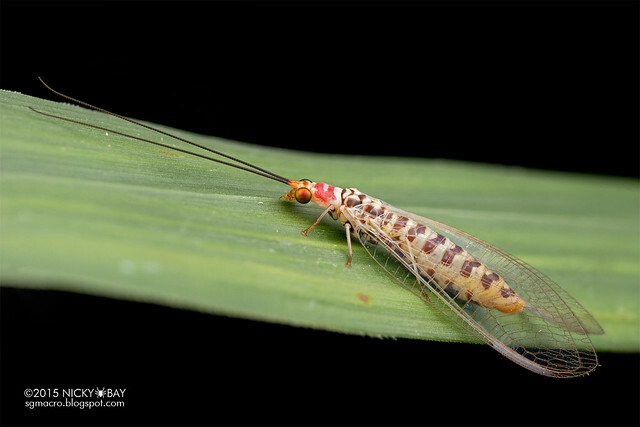 Probably the most vivid species of this family, and possibly the first time recorded in Singapore. Unfortunately this was already extremely weak and almost unable to stand on its own. 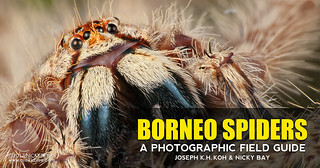 Arguably the most common spider in our parks! 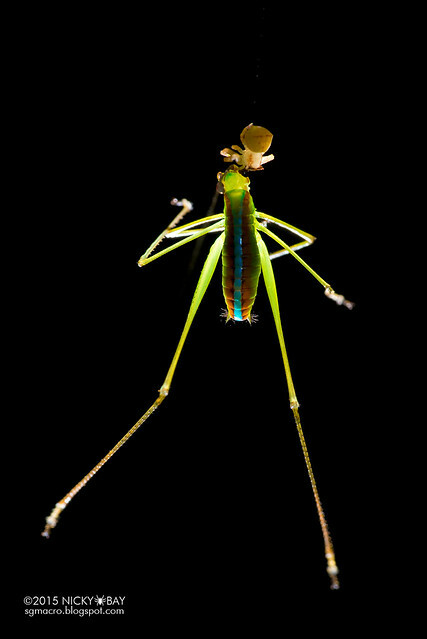 The see-through abdomen and legs of this Chrysso made it a potential candidate for back-lighting. 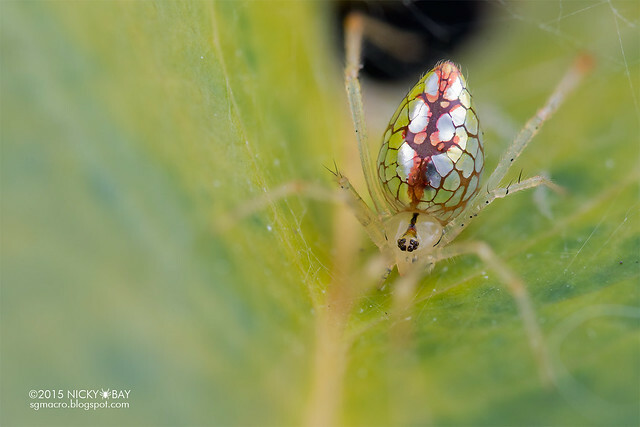 Found in our local mangroves, this seemingly inconspicuous theridiid is seldom photographed. 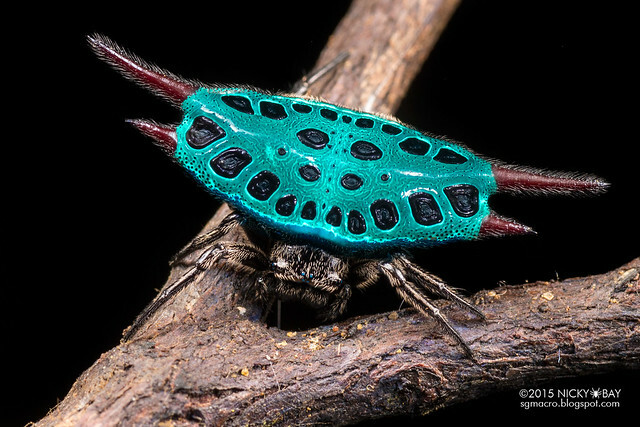 The mirror spider made its rounds on the internet almost 2 years ago after I highlighted its ability to expand its silvery abdominal "plates" when at rest, forming a completely reflective surface on the abdomen. View from the rear shows the expanded "plates". 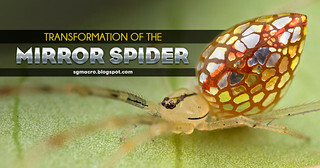 Read more in my earlier post Transformation of the Mirror Spider. 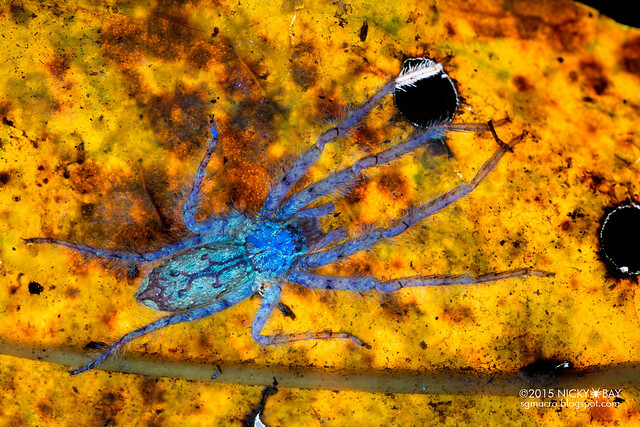 Most others photograph this spider genus under a leaf. 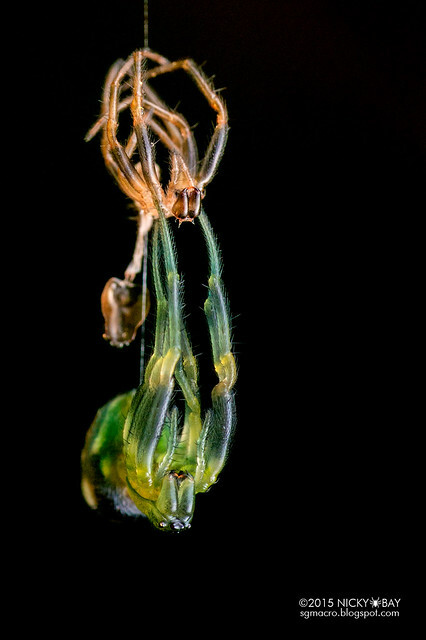 First time witnessing it in the process of wrapping up its prey while dangling on a strand of silk. 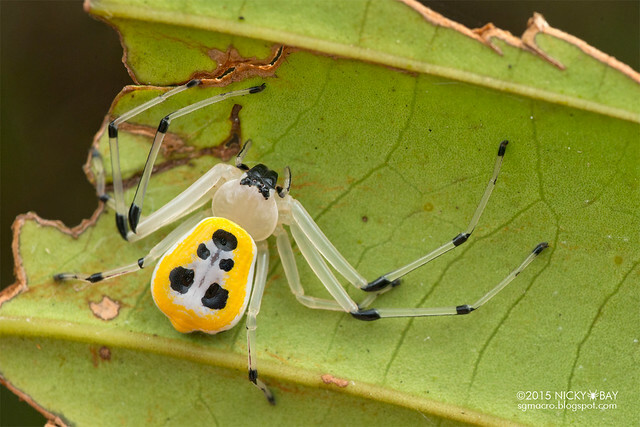 This theridiid may appear bland-looking at first glance, but it appears to have an extensible abdomen! This phenomenon does not appear to be documented. 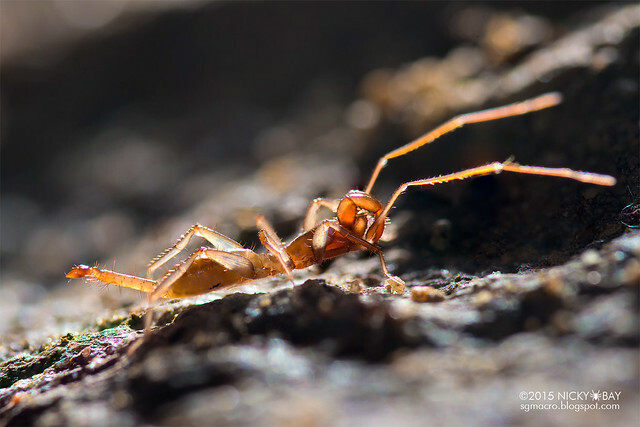 The typical scene of a captured ant by a Janula, this time illuminated with lighting from behind. 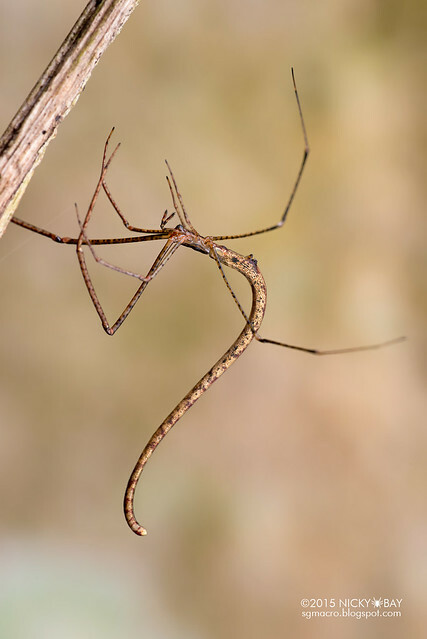 The red twig spider seems to grow to a much longer length than its green counterpart. Glad to see it again! 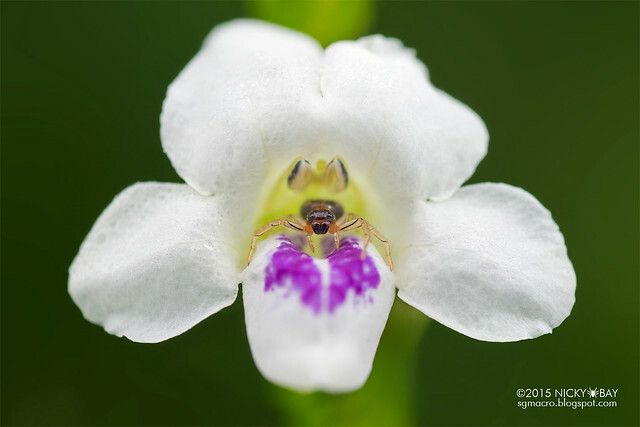 While many have seen the eight-spotted crab spider, this variant has yet to be identified. Looks like it was made of plastic and soft gel. 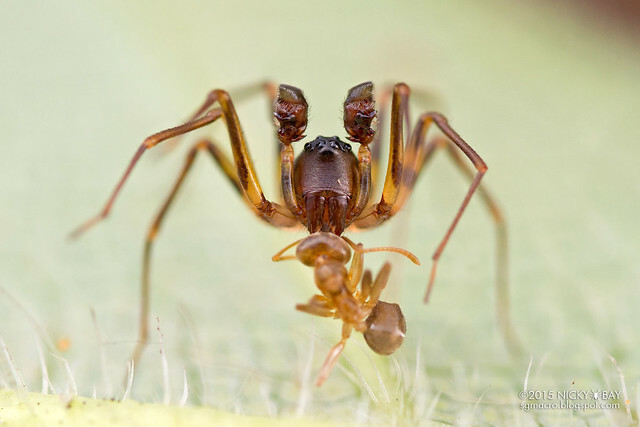 Size isn't really an issue for ambush predators like the crab spider, who willingly takes on prey of any size. Ambush is set up and ready with the predator perched in the middle of the flower. 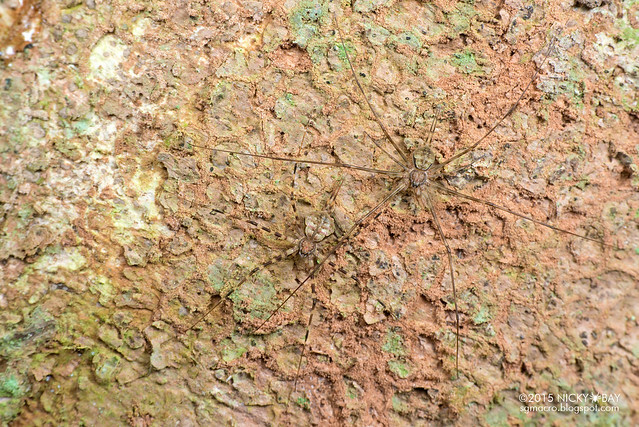 Utivarachna had been moved from Corinnidae to Trachelidae in 2014 by Ramírez. Recognized by the lateral invagination (infolding) just behind the ocular region. Also my first time seeing a pair in courtship! 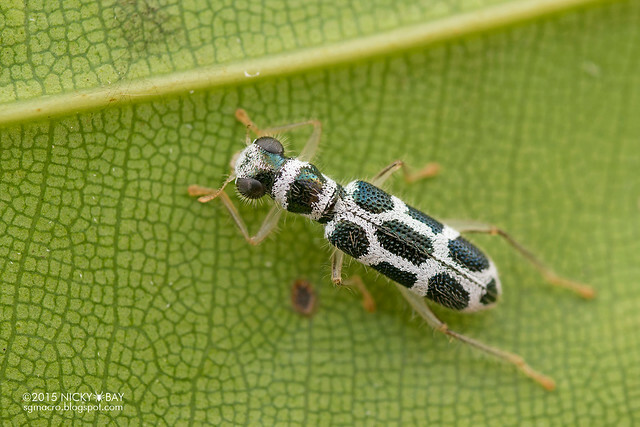 Common zodariid, probably a male Mallinella with raised palps. Had seen these incredibly skittish runners on fallen logs before, but always lost them before taking any pictures. This would be a first! 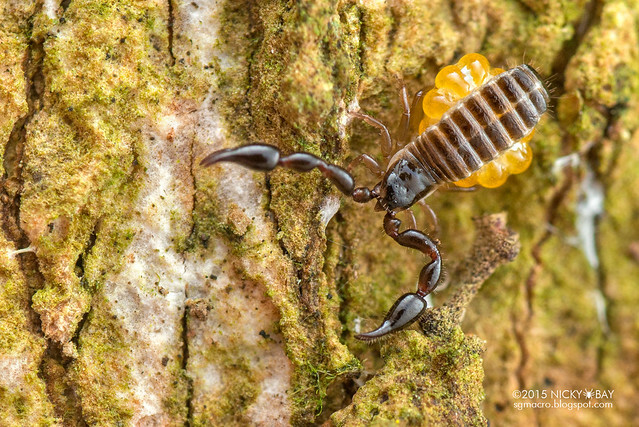 Looks like just a very common scorpion at first glance, but look closer and you might notice a pseudoscorpion clutching tightly onto the scorpion's pincer. Not your common scorpion. Found in a fallen log and extremely skittish. 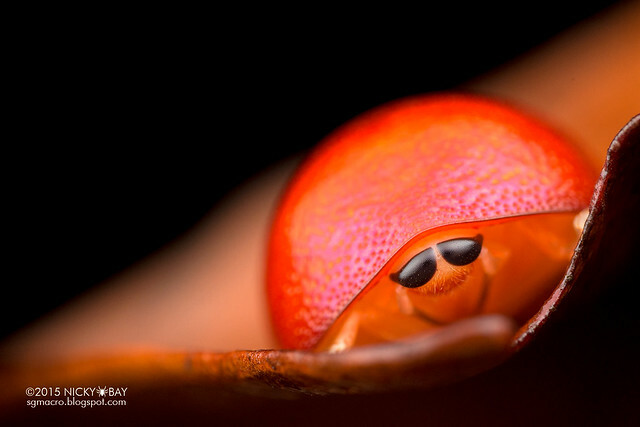 These amblypygids are less than 1cm wide, and usually found underneath rocks. 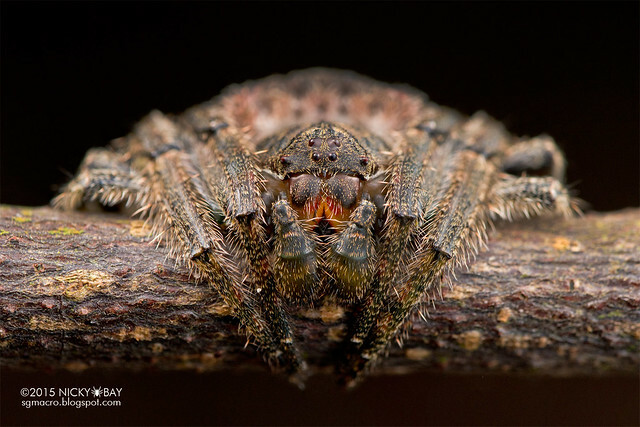 Can never get tired of taking close ups of the red spiky palps. Unfortunately I have not gotten any of them identified yet. 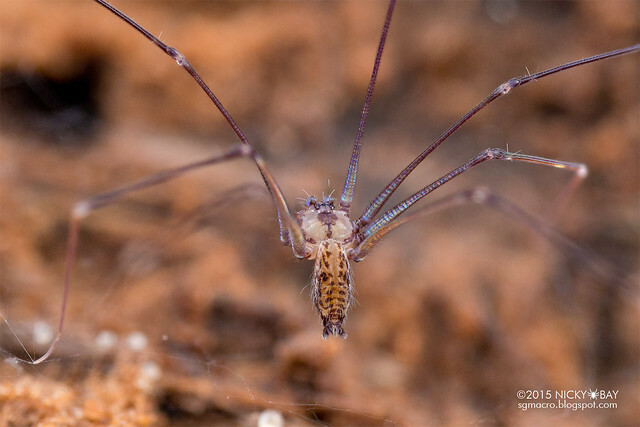 Skipped many harvestmen this year, stopping only for unique angles and lighting. We found a tree with numerous pseudoscorpions. 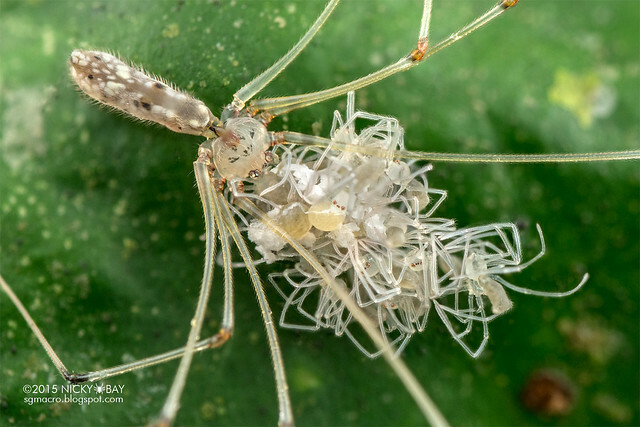 Tapping around revealed this mother-to-be carrying a load of eggs under her abdomen! 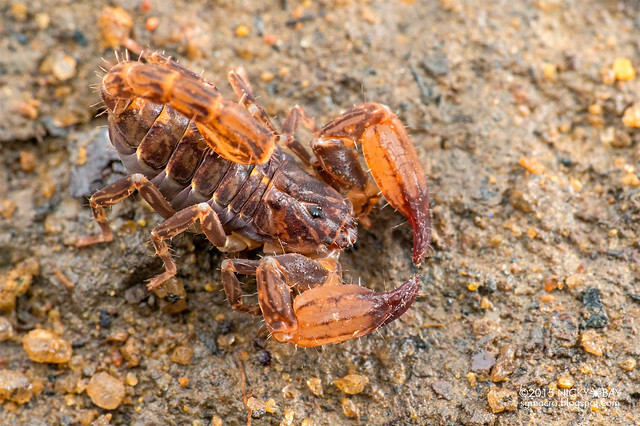 Despite their small size, pseudoscorpions appear to possess immense strength. 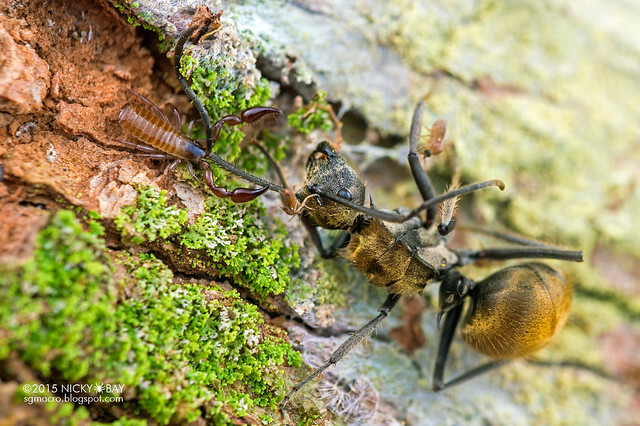 We have seen it pincing tightly on other ferocious arthropods, such as this ant and a mantis. 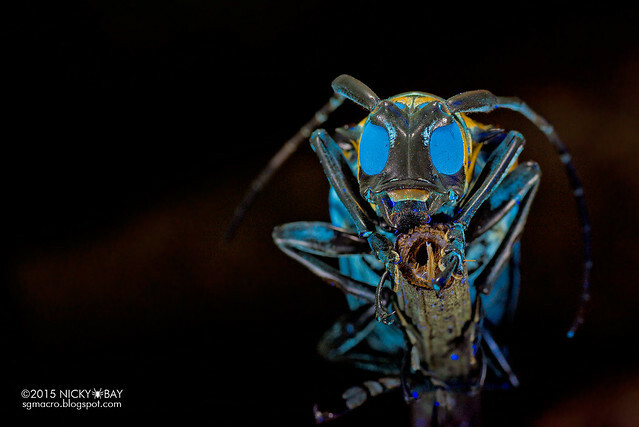 A great subject for ultraviolet photography due to the large compound eyes. 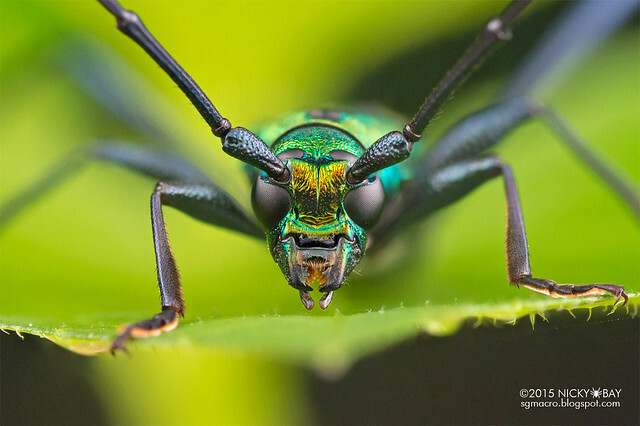 First time seeing this metallic green longhorn beetle found in the central catchment reserve. 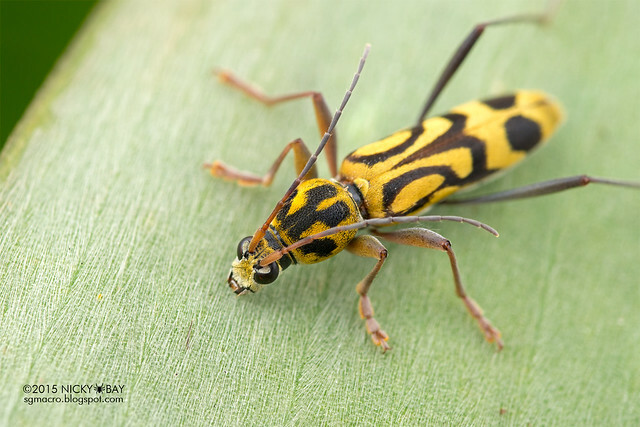 Also the first time seeing this longhorn beetle in Singapore. 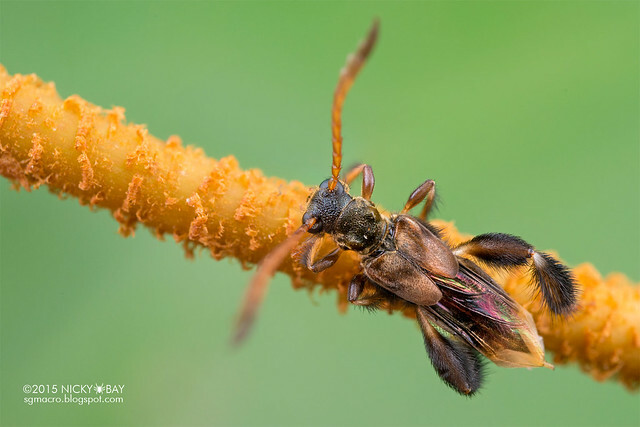 An extremely rare beetle that mimics a stingless bee. This fragile species has an extremely short adult lifespan which made this sighting even more precious. 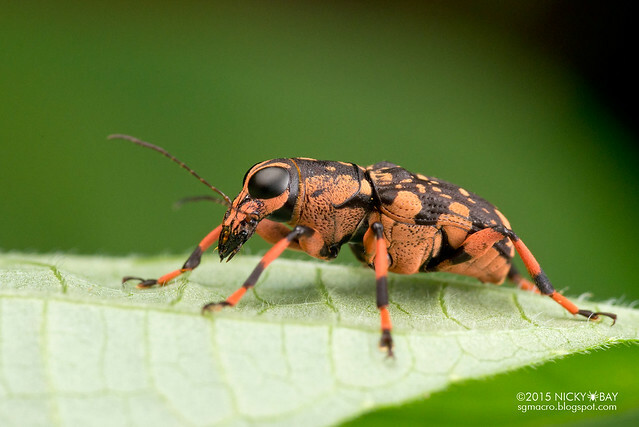 Checkered beetles are not common in Singapore but some do frequent certain trees. 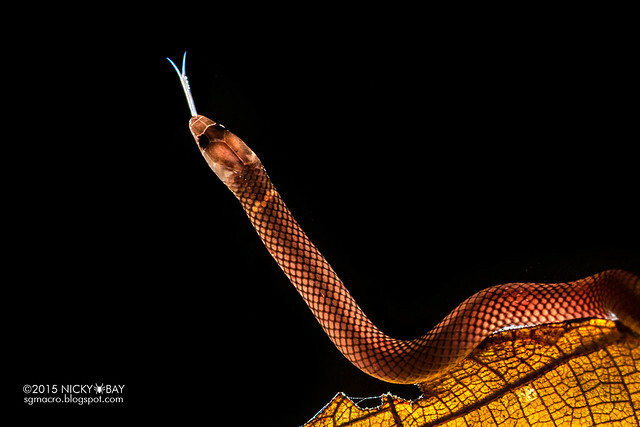 This particular specimen was found under a leaf. 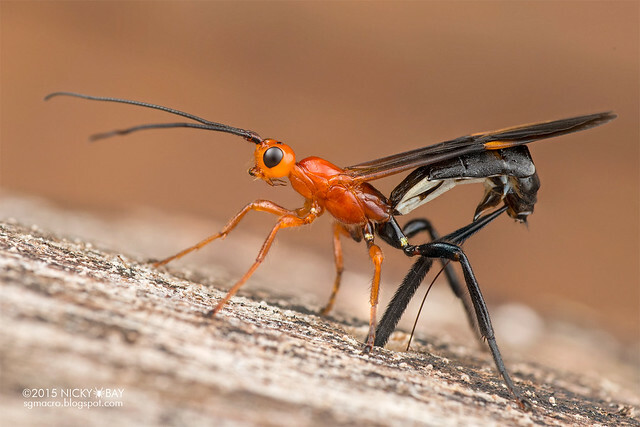 Anthribids are pretty common here, but this makes the list for the deep orange tone. 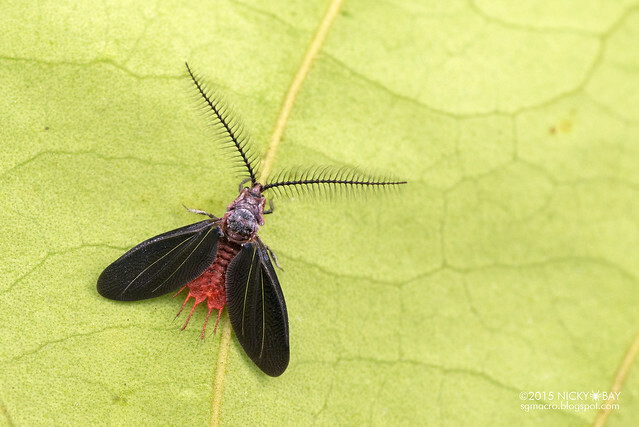 The evil looking ultraman-eyes are typical of many anthribids, but the antennae of this are lined with long hairs as well. Most probably missed out by others, as this tiny little dot turned out to be a super adorable anthribid as well. 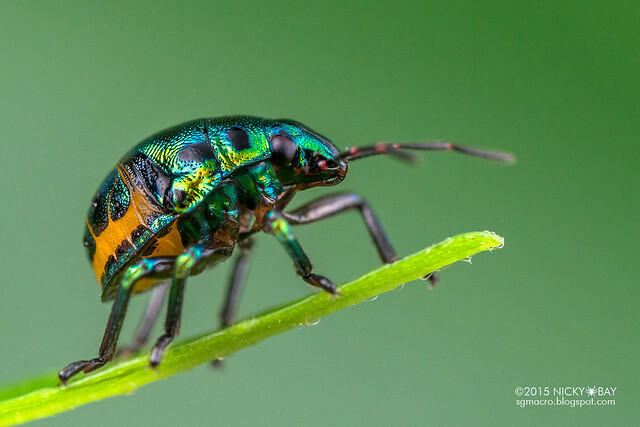 Some awesomely spiky leaf beetles could also be spotted in the foliage as well. 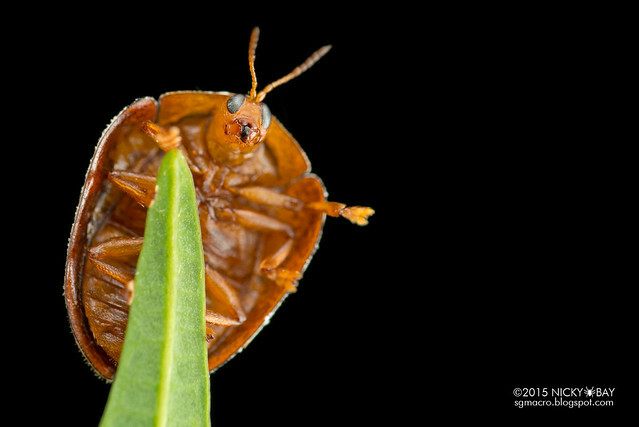 And then there's the occasional tortoise beetle trying to give me directions. 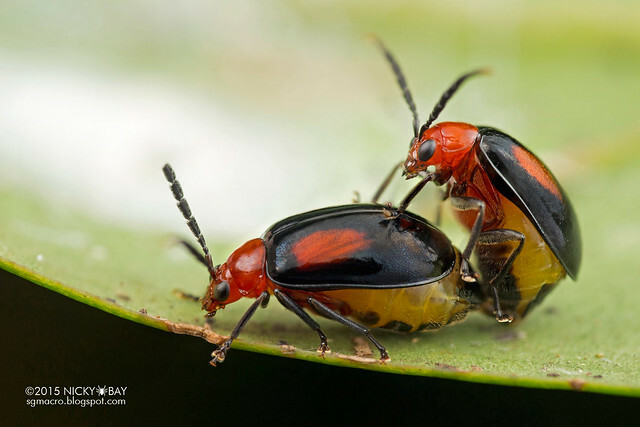 A charming pair of leaf beetles making out in a sunny morning. Female walked around but the male stood firmly anchored with her. 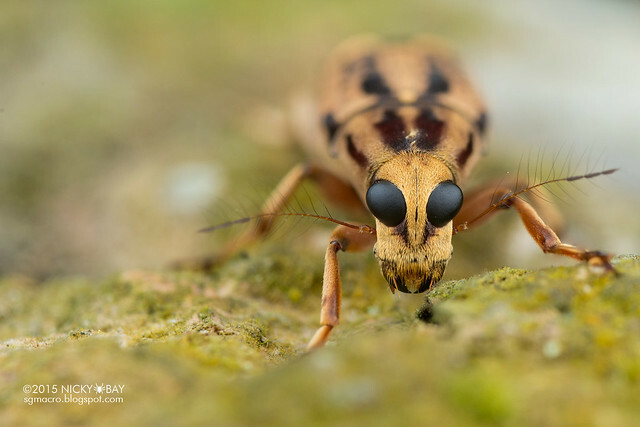 A gorgeous click beetle with enlarged pronotum, found together with the remaining patch of lantern bugs in Singapore. First time seeing a local lucanid. 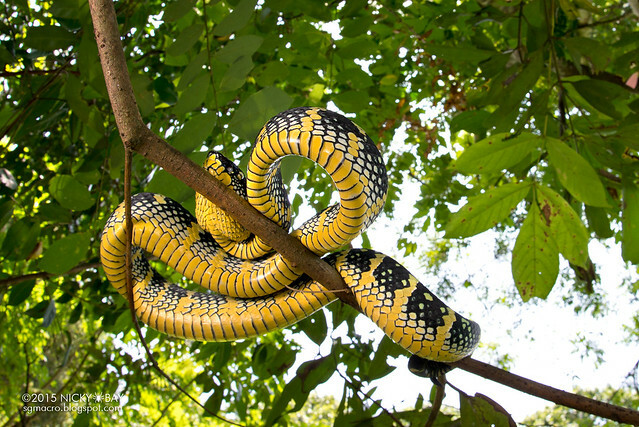 This male was found with several other females inside a crevice at the base of a tree. Tinge of ultraviolet thrown in to light up the eyes. 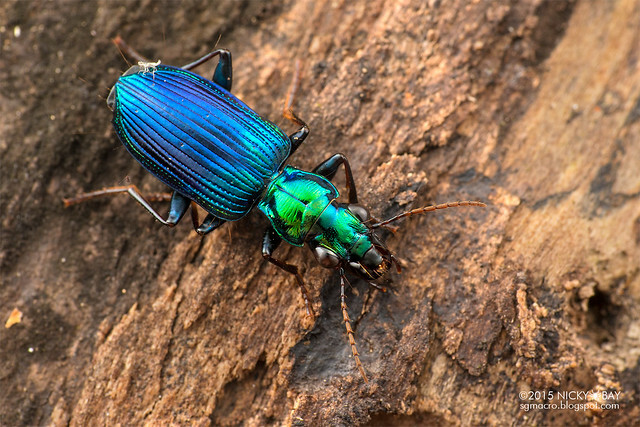 This darkling beetle had captivating colours and an even more alluring twin humps! 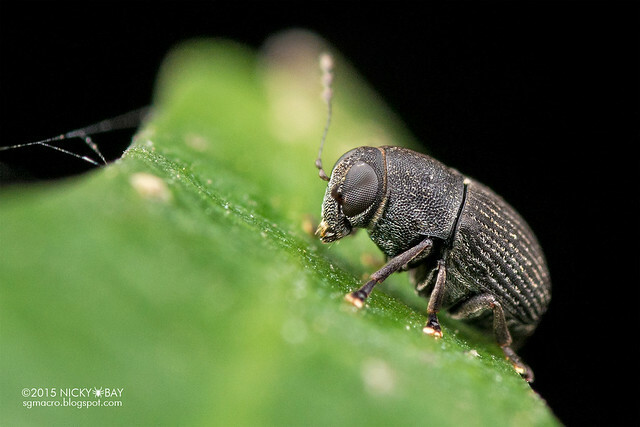 Incidentally, these darkling beetles do not look as cool when lighted with a point light source. 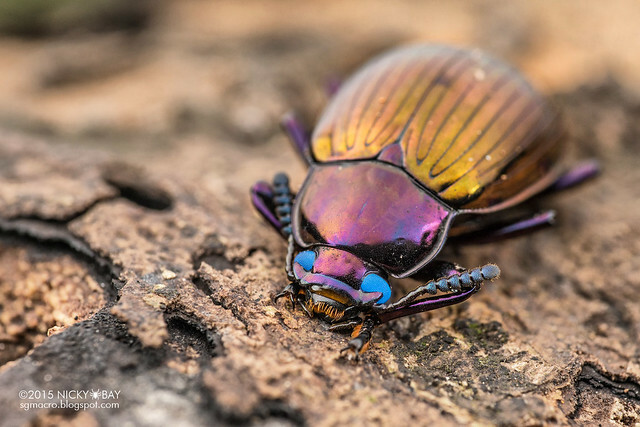 Using a large and even lighting allowed the colours of the entire beetle to show up. 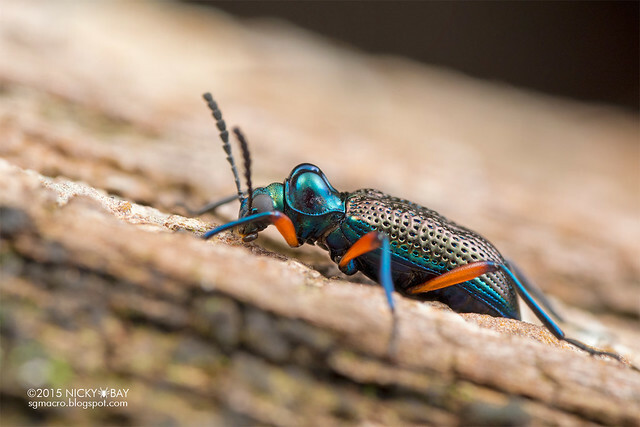 The resident of many fallen logs of our forests, always a delight to photograph for the brilliant colours. 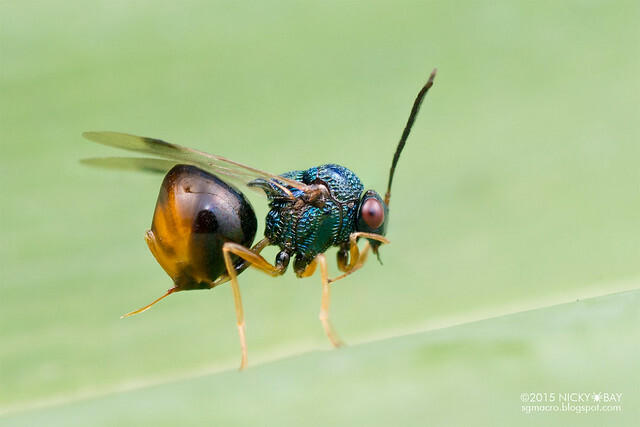 Not often seen, this pair of endomychids had interesting dual protrusions on their elytra. The female didn't seem too bothered with the mites running around! 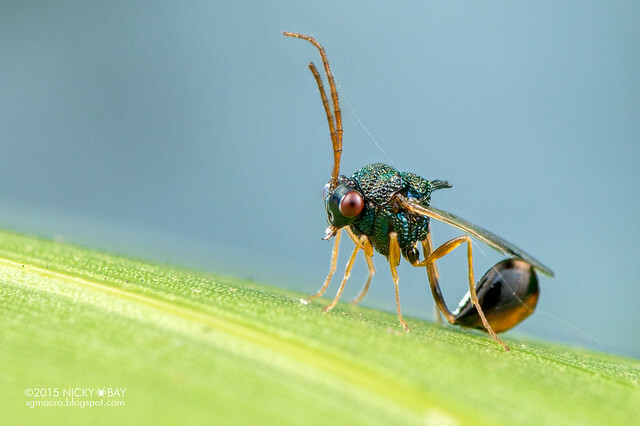 This minuscule parasitoid wasp was poking around the patch of shield bug eggs. 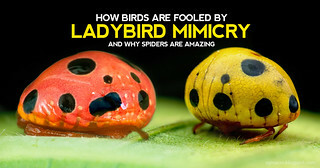 Not sure if she had already laid her eggs in them? We've seen the female velvet ant many times, but this is my first sighting of the male! A female was also spotted nearby but he didn't approach her. 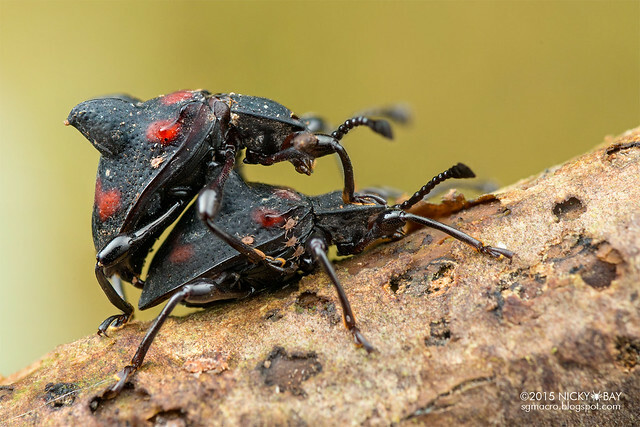 Next step would be to find a mating pair..
Eucharitids tend to be very tiny, but cooperative subjects and extremely tolerant towards clumsy photographers. Another eucharitid with a waist to die for. 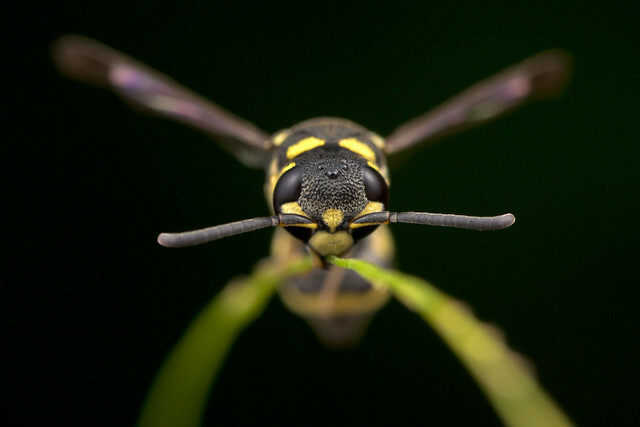 A slightly different view of a sleeping potter wasp. 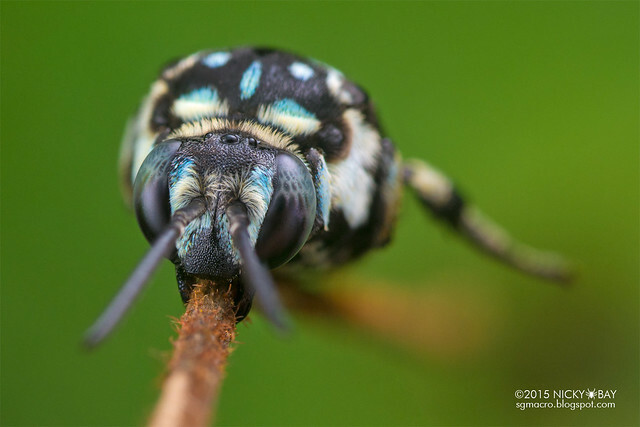 Our favorite sleeping cuckoo bee - this was a teeny bit yellowed but still a lovely sleeping beauty. Surprise find of the night. 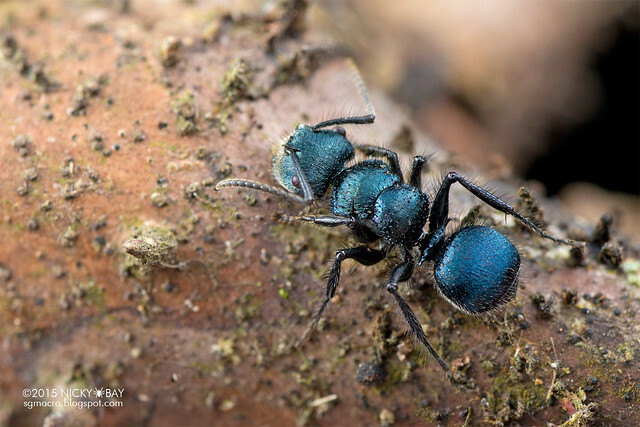 We often ignore the little ants scurrying around, only to find that some were actually blue! Lucky shot for me as this braconid was only ovipositing for less than a minute before it went around tapping on a fallen log again. Wonder what beetle larvae could be underneath? 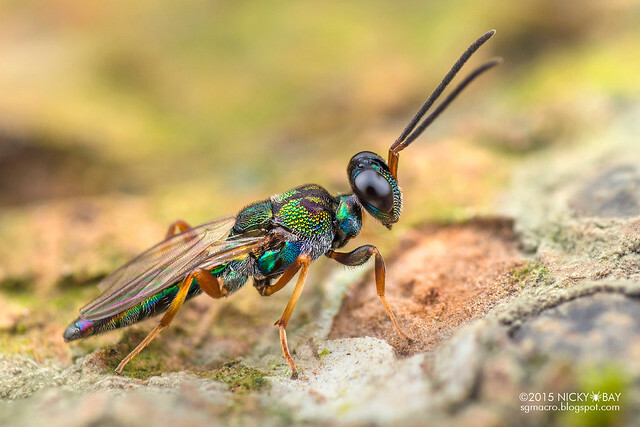 Freakishly small and skittish wasp, but mind-blowing when viewed up close. The true flying jewel! 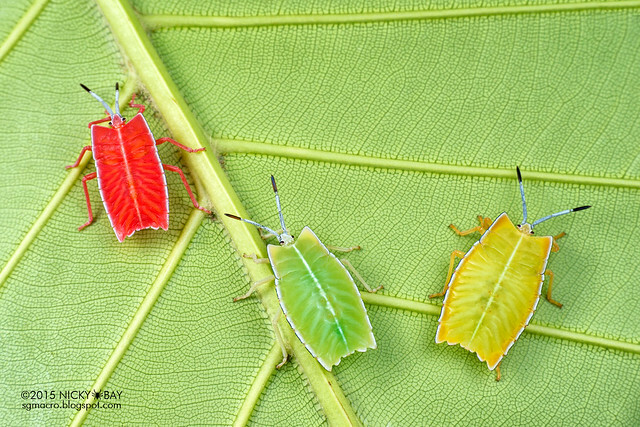 These shield bug nymphs had been sighted in various colours, but this is the first time finding 3 with traffic light colours together! 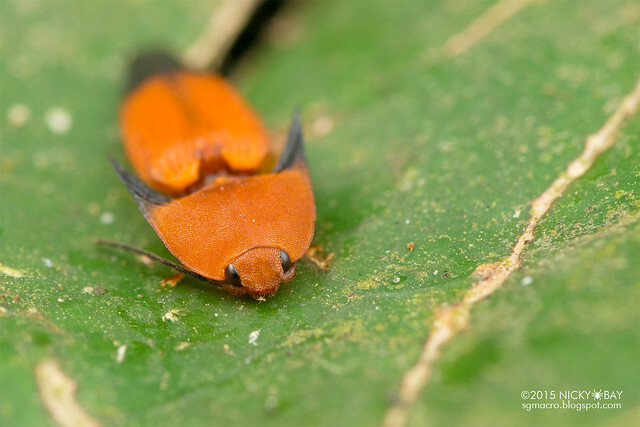 Cute platypus-ish leafhopper, first sighting as well! 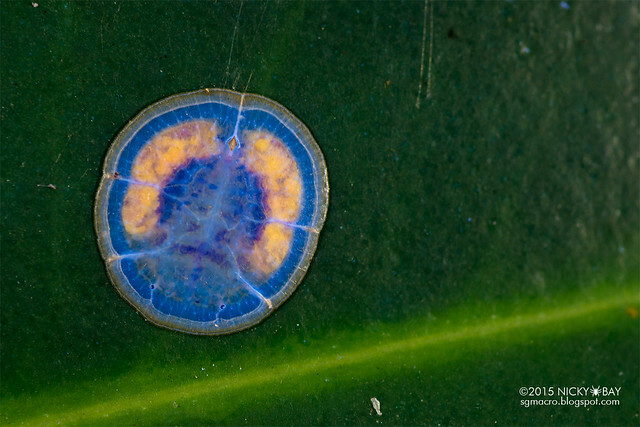 No idea what this is, but it looked like a little jelly bean. 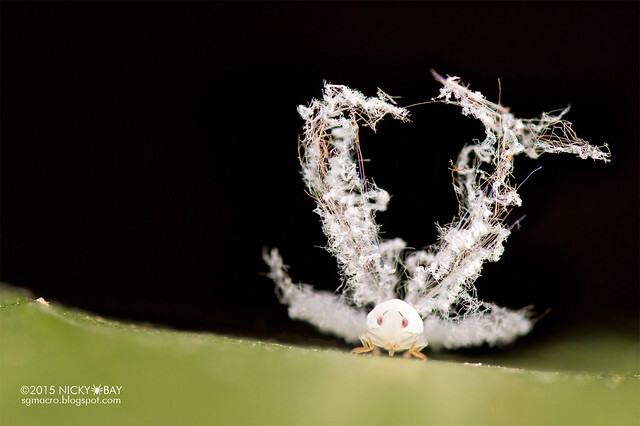 The bizarre waxy tails of planthopper nymphs appear to come in a myriad of forms. 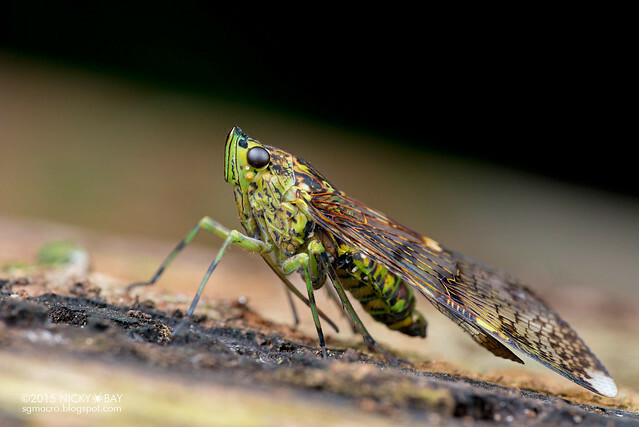 With such intense colours and patterned wings, this derbid should be high on a macro photographer's wish list. 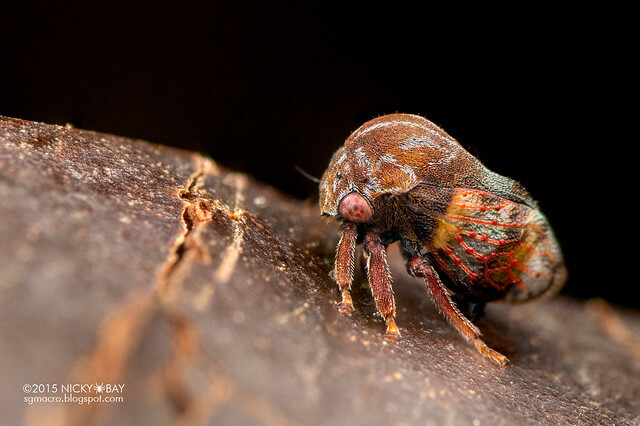 This large planthopper is sometimes mistaken for a cicada. 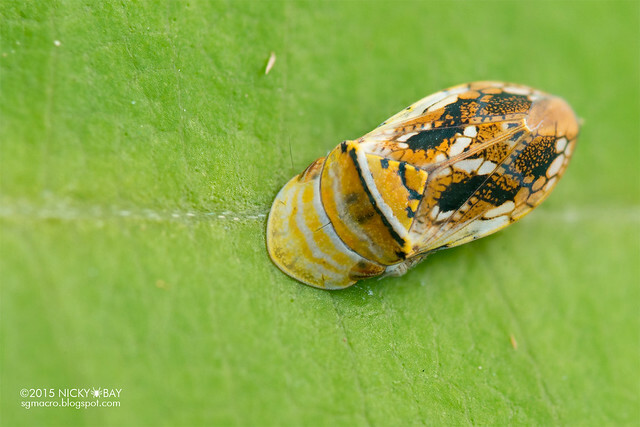 I've always questioned what the adult of this fulgorid looked like. Anyone has any clues? Seen it quite often, so I took a different approach this time. 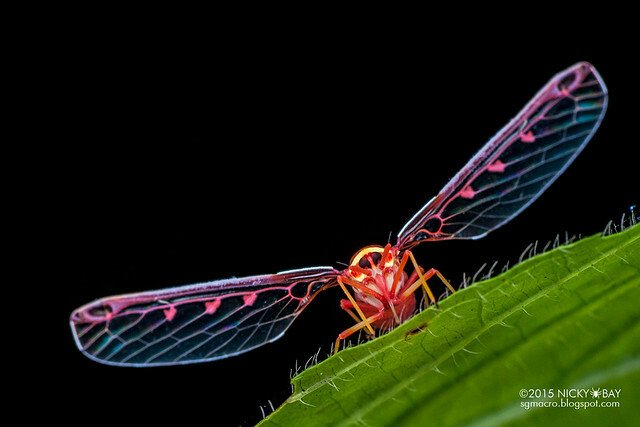 Only lantern bug that I've ever seen in Singapore. Appears to be seasonal. This was over 3 meters above ground and shot from a distance. 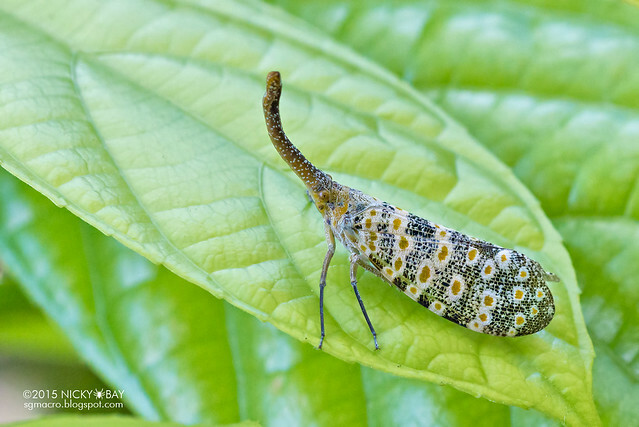 These scale insects are extremely slow flyers. Next on my wish list would be to shoot it in flight. I did have some in-flight shots before but they were lacking in sharpness. 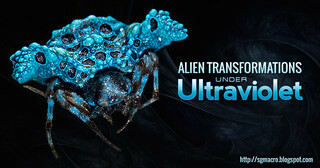 Why do so many people question whether aliens exist when we have this? 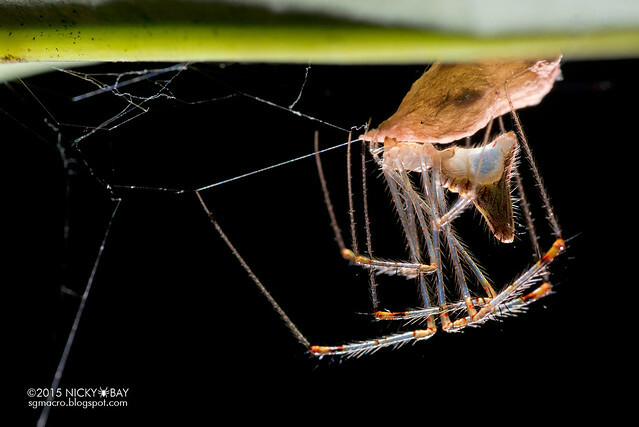 Thread-legged assassin bugs may appear to be fragile, but they are quite adept at capturing prey. 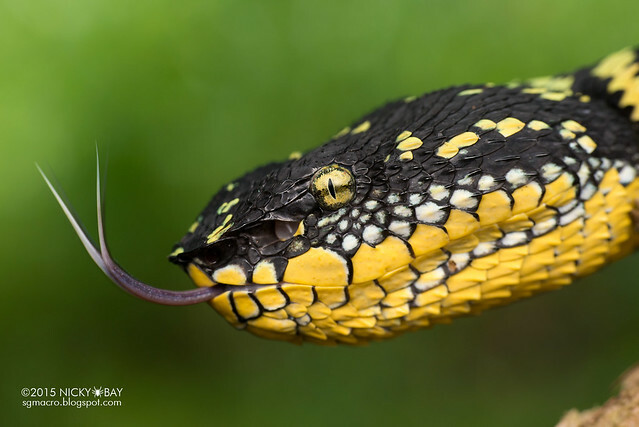 Guess what the prey is? 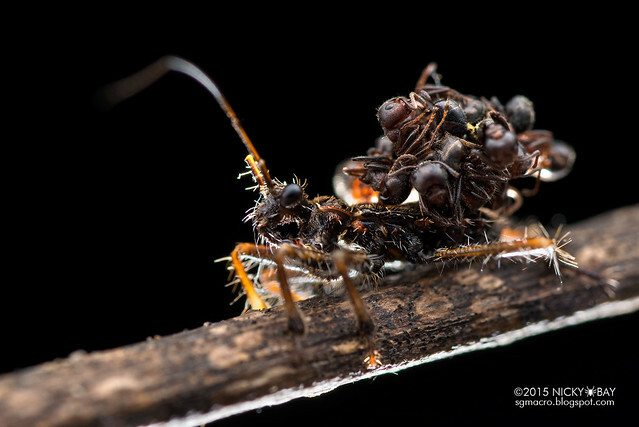 The classic corpse-pile on the back of an ant-snatching assassin bug doesn't get any more brutal. Helped a bit with the folks filming Wild City episode 3, do look out for it! 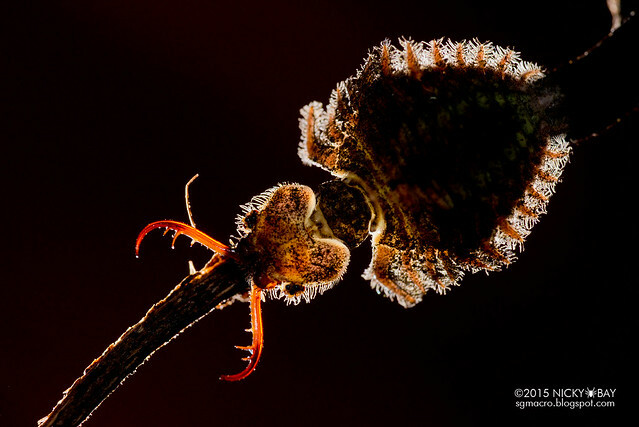 For more on these gruesome assassins, read my earlier post: Gruesome Tactics of an Ant-Snatching Assassin Bug. 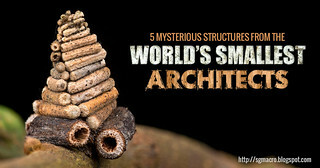 My next goal would be to film or photograph the act of stacking the ants. Apparently, the stacking is done from the bottom and not the top! 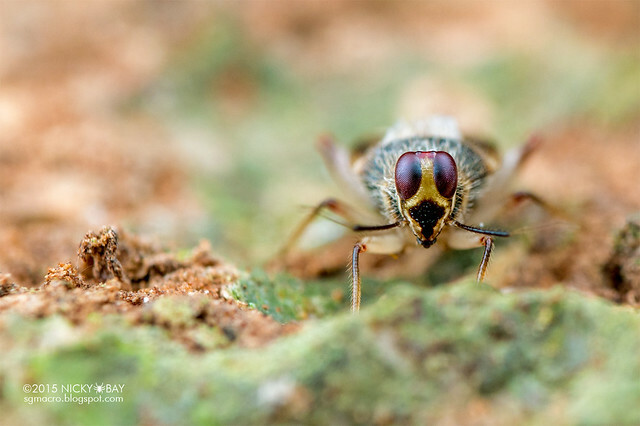 Seen occasionally, the eyes of this mirid is distinctly heightened. 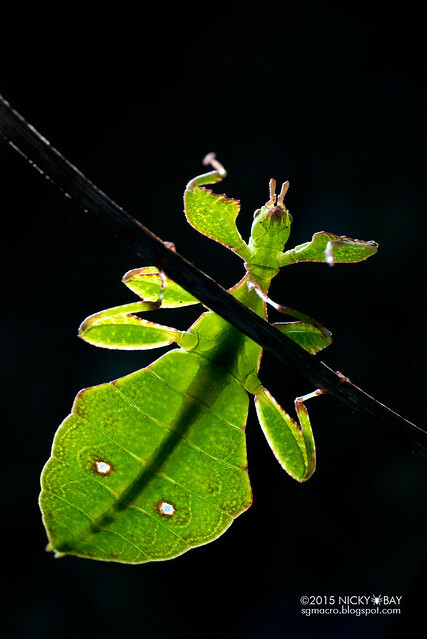 This is still a nymph, but due to the "metallic" body, many are mistaking it to be a beetle. 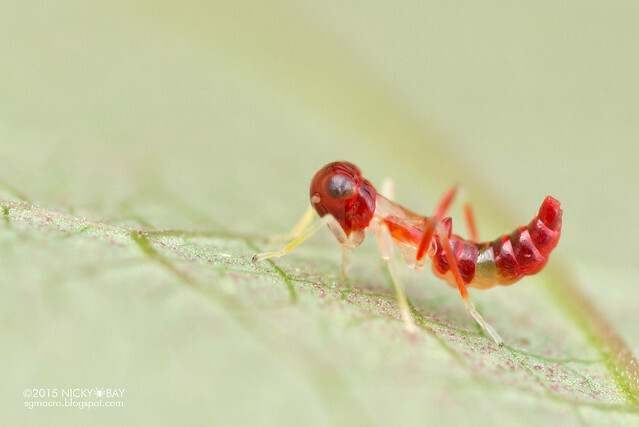 Another tiny speck that revealed a strange network of red nodules on its wing veins. 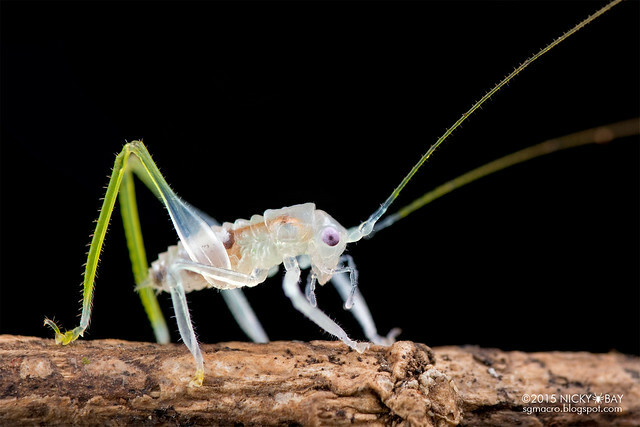 An all time favorite would be a back-lit shot of a moulting cricket with wings freshly pumped out. The additional colours are a bonus! This poor cricket was covered with mites. They probably had been sucking on the cricket for some time as some were already quite fat. 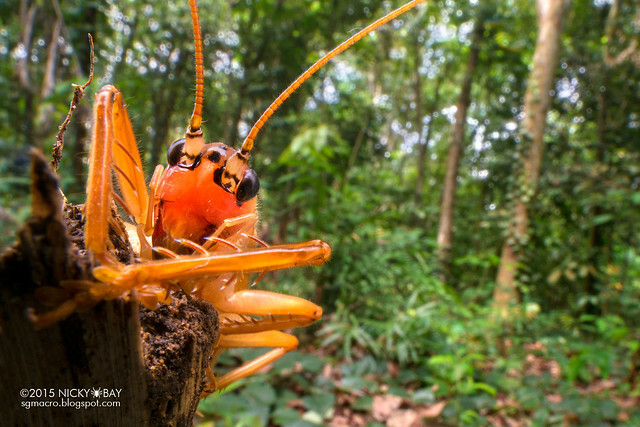 Unconventional view of a cricket when I was testing the Venus 15mm wide angle macro lens. 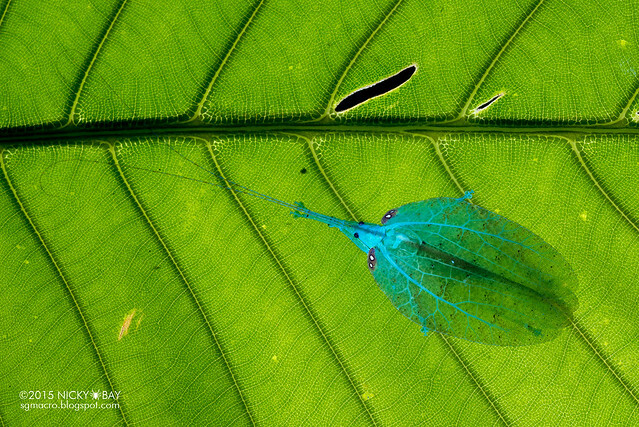 Ultraviolet brings out the veins on the wings of this leaf-mimic katydid beautifully. Since it was ovipositing, I had the opportunity to try a wide angle view at night. This was shot with the Sigma 15mm fisheye lens, and the lights in the background belonged to my friends who ignored my calls to stay out of frame. Turned out nicer than I imagined! Just a nymph or fresh from moult? Bit of backlighting and ultraviolet to highlight the wing veins. 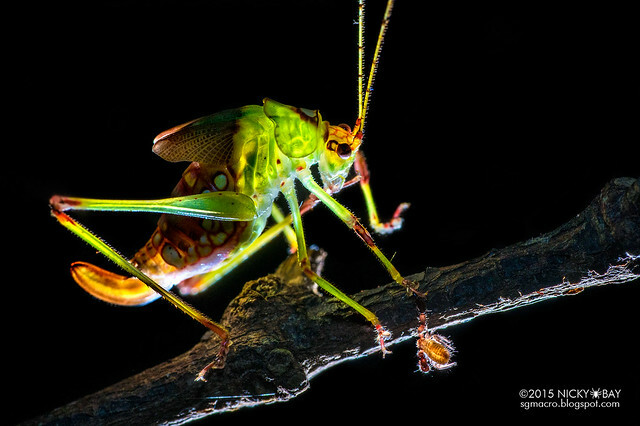 Katydids are excellent subjects for back lighting as many allow light to pass through parts of its body. 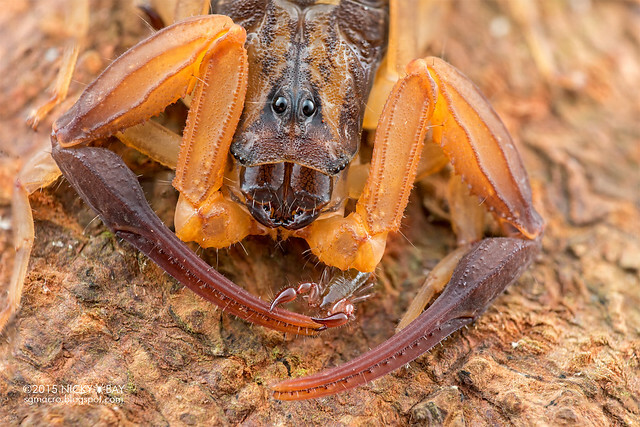 In this scene, a bonus pseudoscorpion was pincing the katydid's front leg. 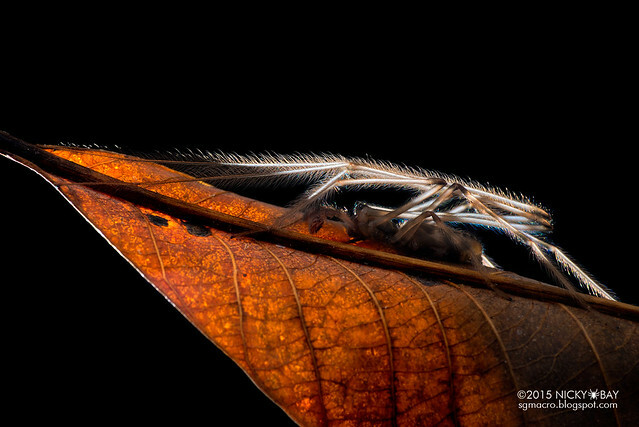 This master of a mimic masquerades as a dead leaf, complete with holes in the pronotum! 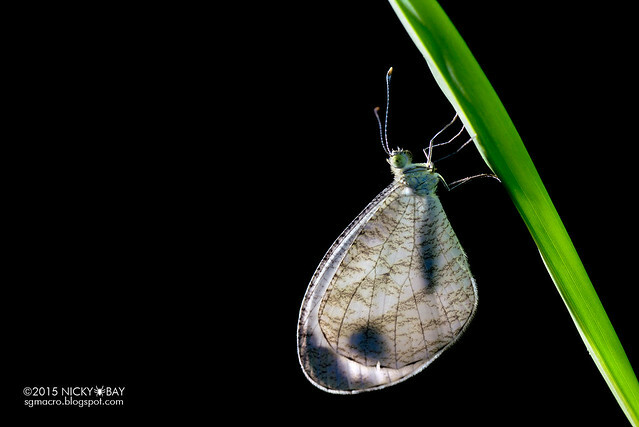 This butterfly was resting quietly in the night. 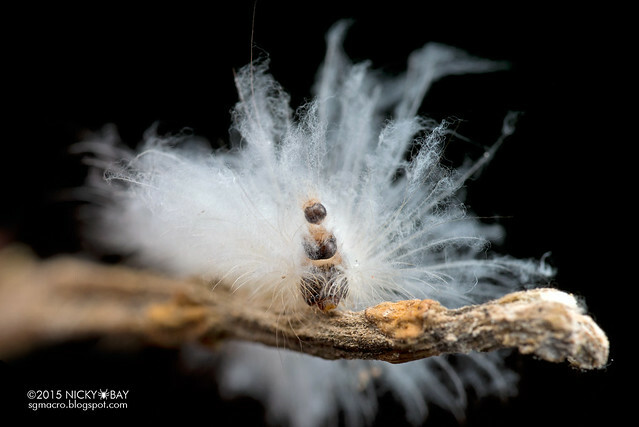 A bizarre scene where a caterpillar keeps the exoskeleton of its head of each previous instar, creating a tower of heads! 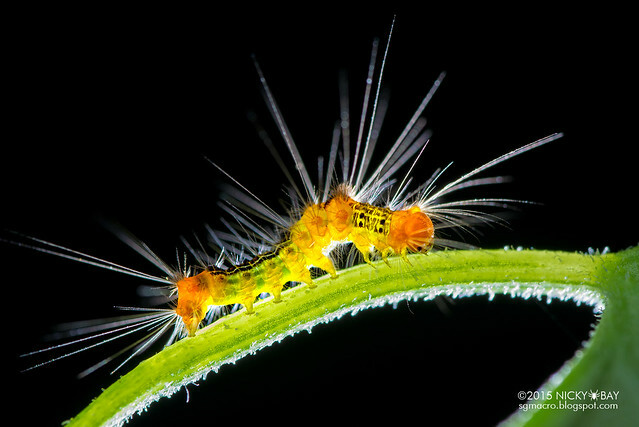 Read my earlier post on this caterpillar here: Meet the Multi-Headed Caterpillar. 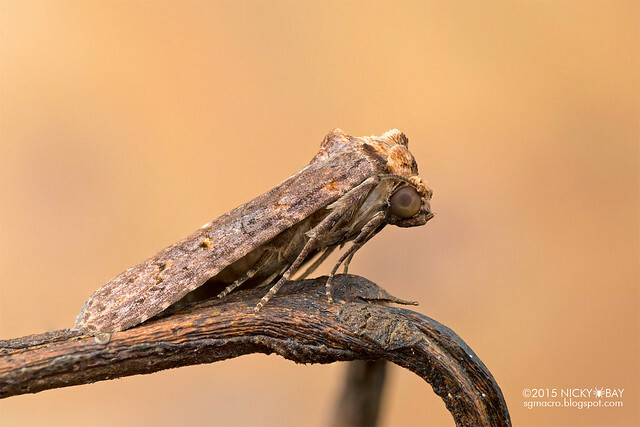 Spotted this moth resting at the tip of a broken branch. It was a perfect camouflage when viewed from far, didn't look like a moth at all! Possibly an injured moth, looked oddly asymmetrical. 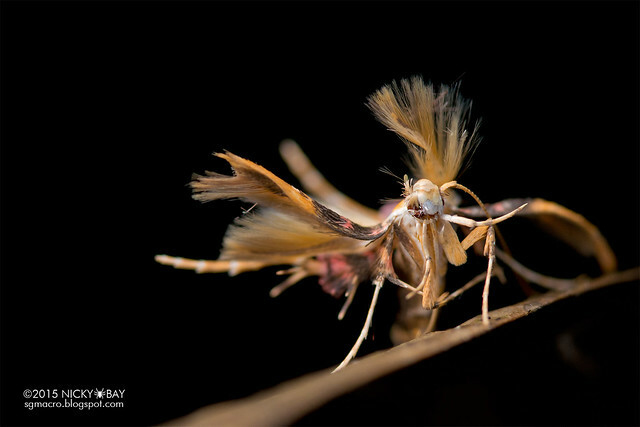 Freshly emerged, this lymantriine moth looked really fluffy! 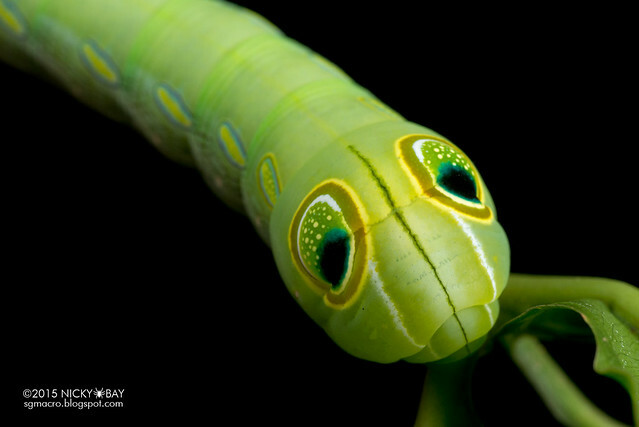 An interesting hawkmoth larva that adjusts its folds to reveal a pair of pseudo-eyes! 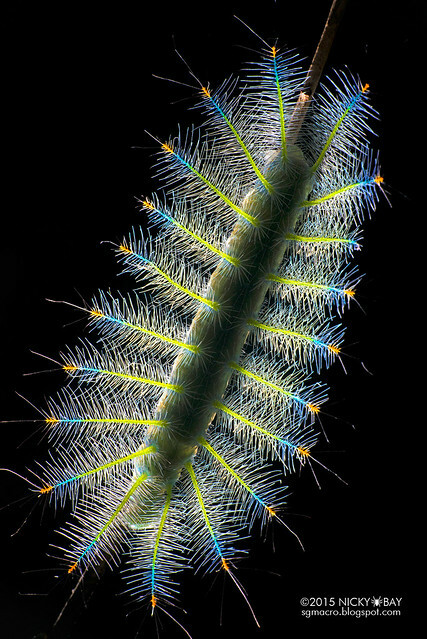 Fluffy caterpillars are great for back lighting. 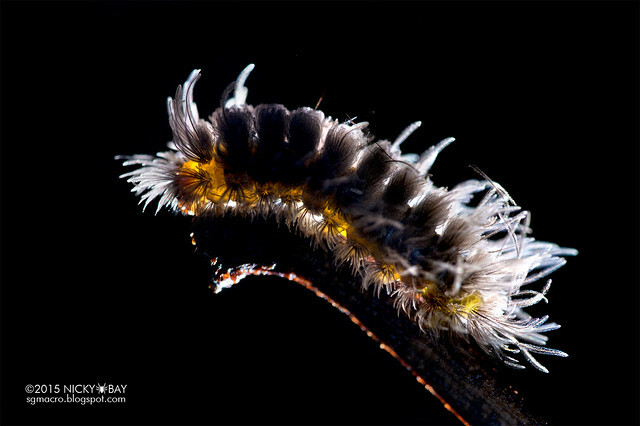 In fact, most of my caterpillar shots would have some examples of back lighting. 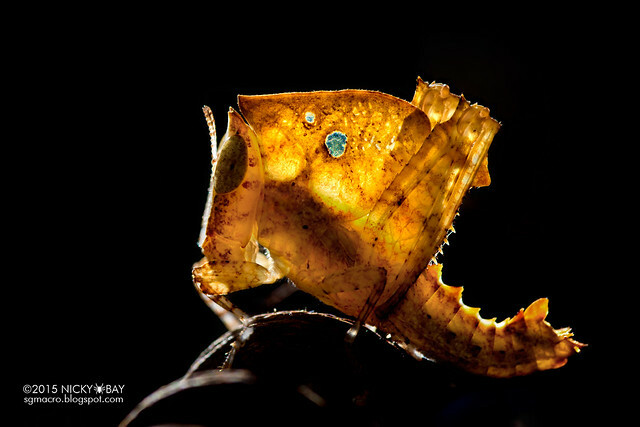 A tiny one that allowed light to pass through its body. 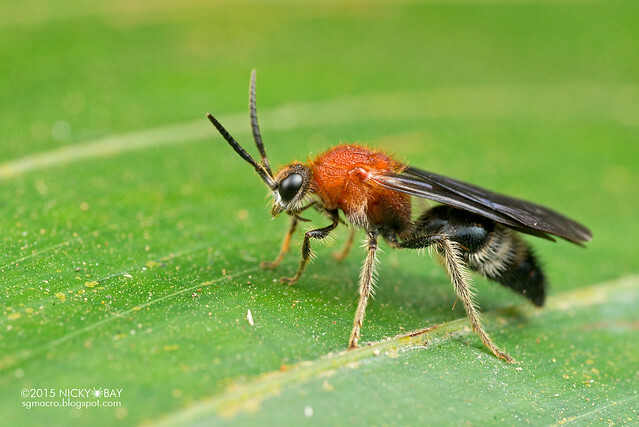 A truly bizarre species that mimics the red weaver ants. Perhaps they obtained protection by hanging out with the ferocious ants? The classic "Christmas Tree" too! 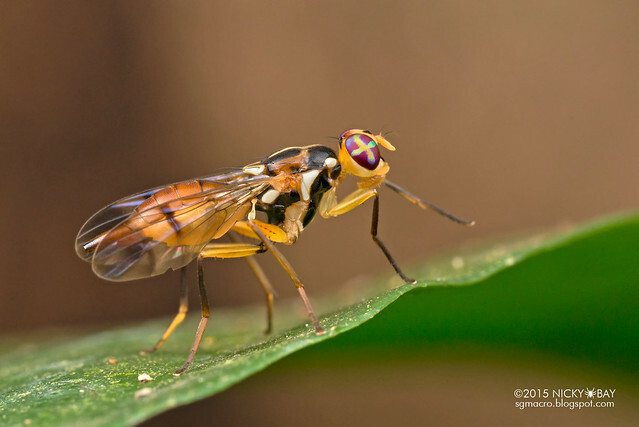 Very common fruit fly, perhaps that's why I have not been shooting it. Anyway, here's a record shot! 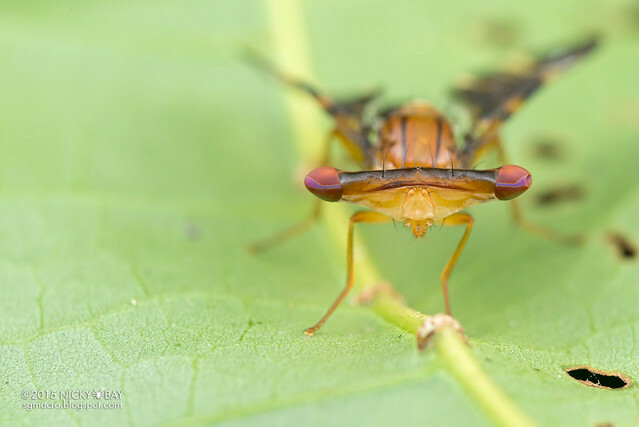 Interesting hammerhead fly with a slight dent on its left eye. 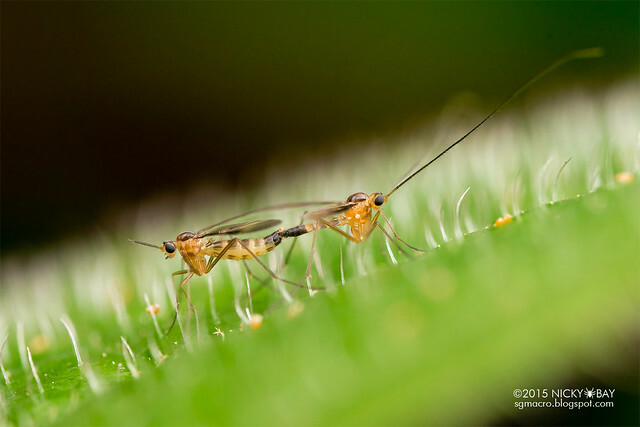 Tiny little specks turned out to be mating on a leaf! 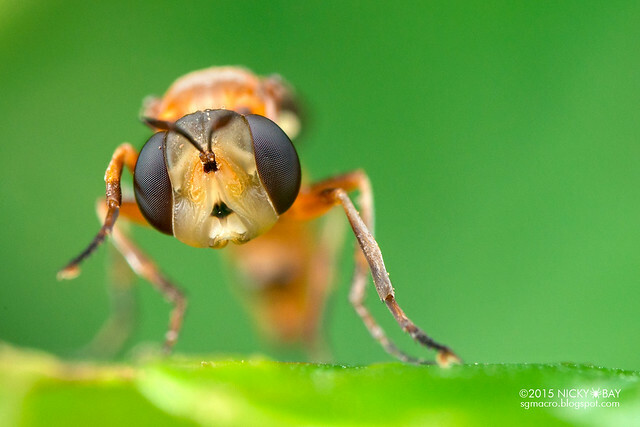 Initially thought to be a hoverfly, but turned out to be a new record for me! 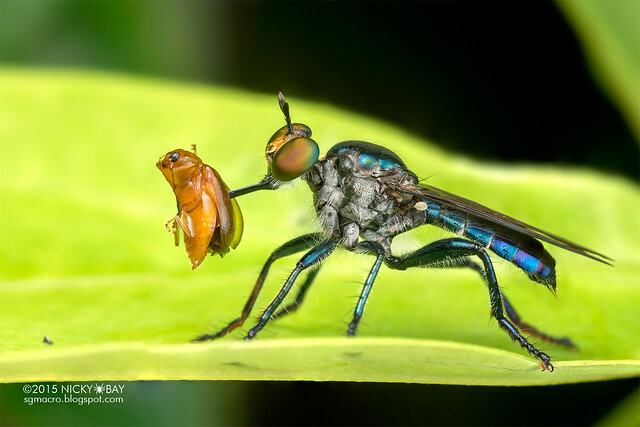 Favorite fly among macro photographers, due to its high hit-rate of snagging prey. The leaf beetle didn't stand a chance at all. 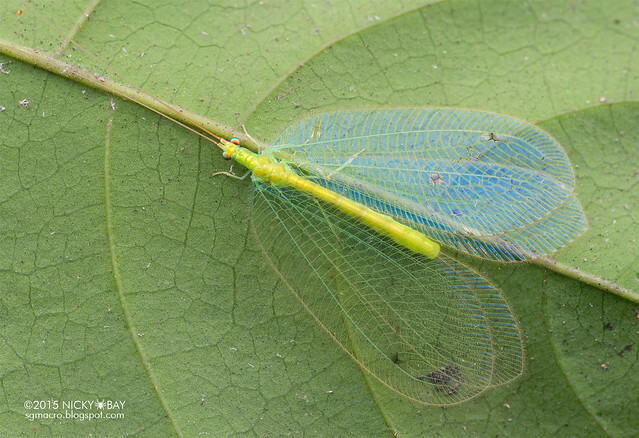 Probably the most beautiful lacewing in Singapore. It has been spotted in the north-east several times, and I was lucky to see one just before leaving the park. Looks like the common lacewing in our parks, but this was at least twice the size, with some dark markings on the wings. 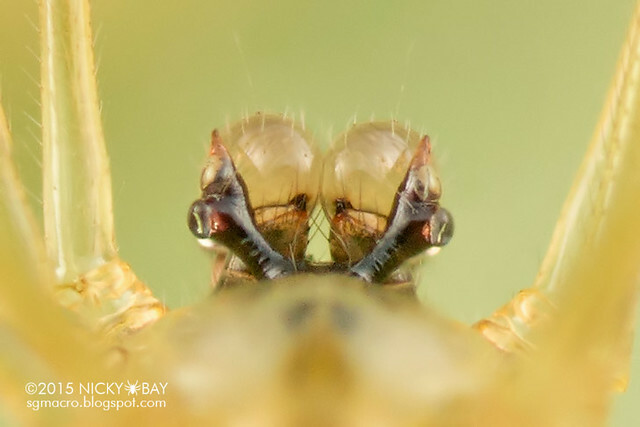 An owlfly larva spotted in the day. And I always thought that they were nocturnal. 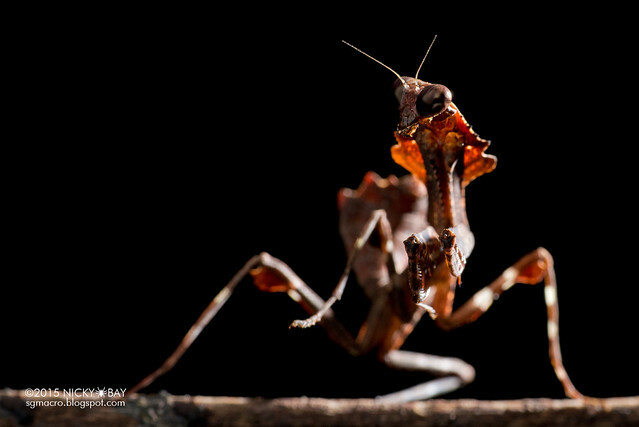 Mantids tend to give the widest variety of poses. Had to be ready at all times in case it did an epic pose. 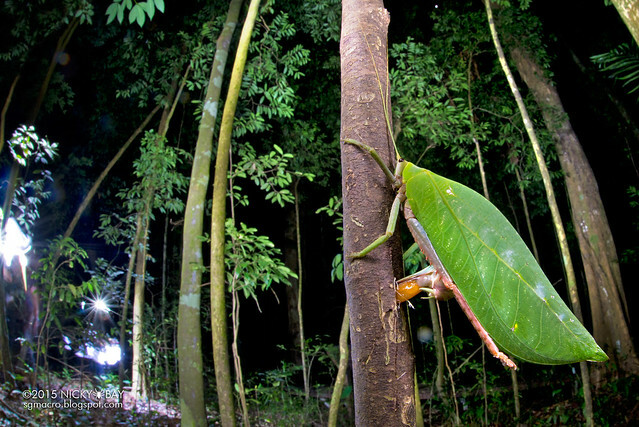 Interestingly, this is the first time I'm seeing a mating pair of mantids in Singapore. Previous encounters had only been in Malaysia. 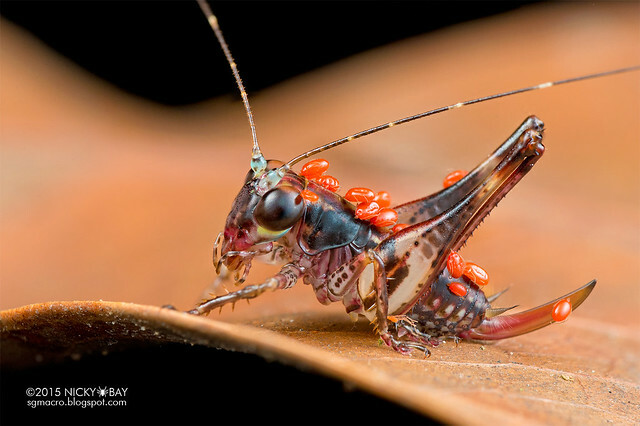 A cherry-red pill cockroach looked as if it were wearing shades from this angle! 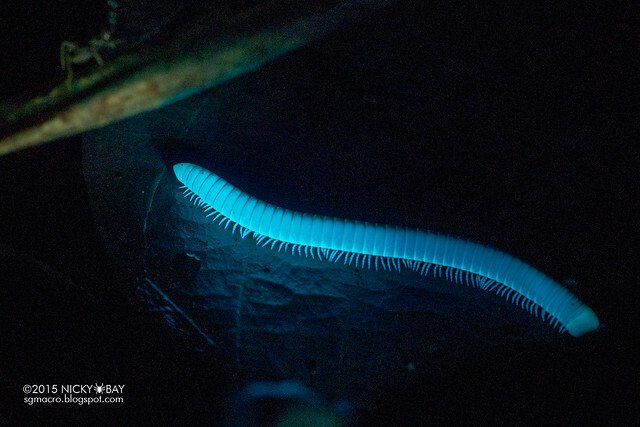 This was featured in Wild City episode 2, except that the fluorescence on this millipede was much brighter. 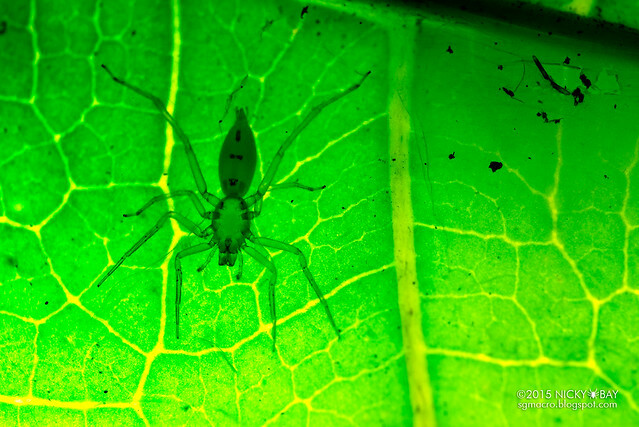 The light fluorescence was bright enough to illuminate the leaf it was on! 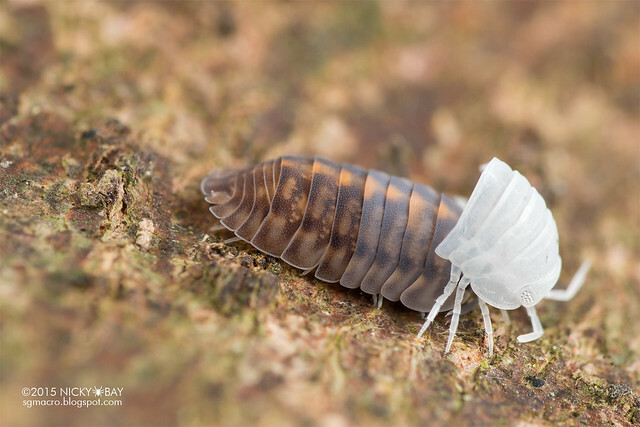 Woodlouse fresh from its moult. Not sure which direction it was supposed to be headed though? 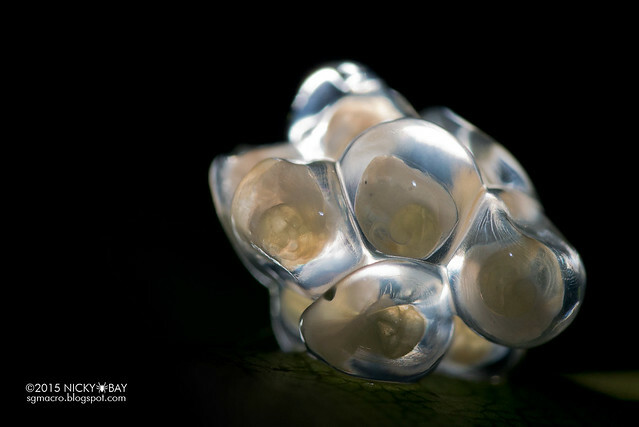 It was only with the curiosity of my friends that we discovered the tiny embryos within these snail eggs. Delicate, yet spellbinding. 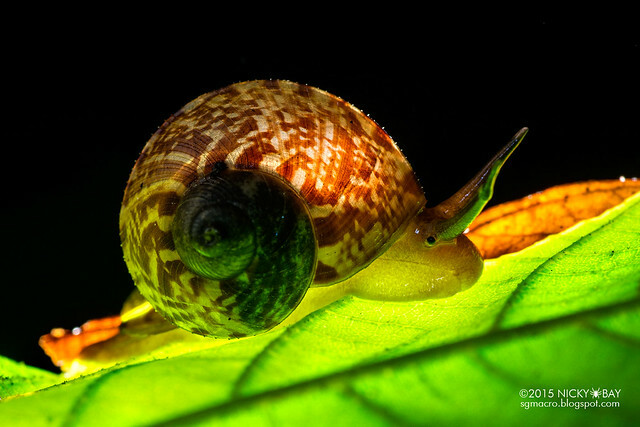 This snail's shell also showed up nicely with back lighting. 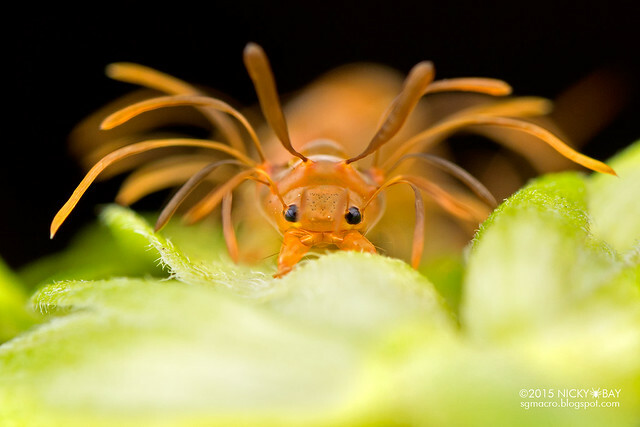 The eyes are interestingly situated at the base of the tentacles. 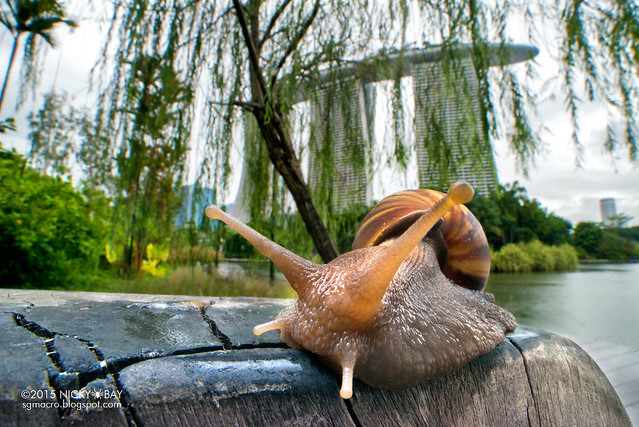 The very first wide angle test shot with the Venus 15mm wide angle macro lens at Marina Bay Sands. 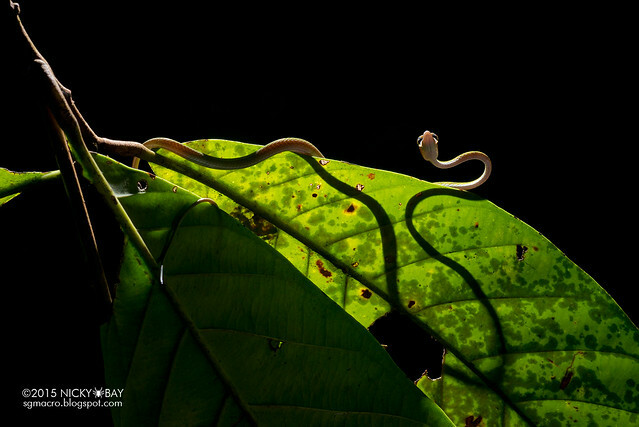 The extremely slender whip snake grips tightly to the branch with its tail, and is able to jump a distance after forming this S-shape. 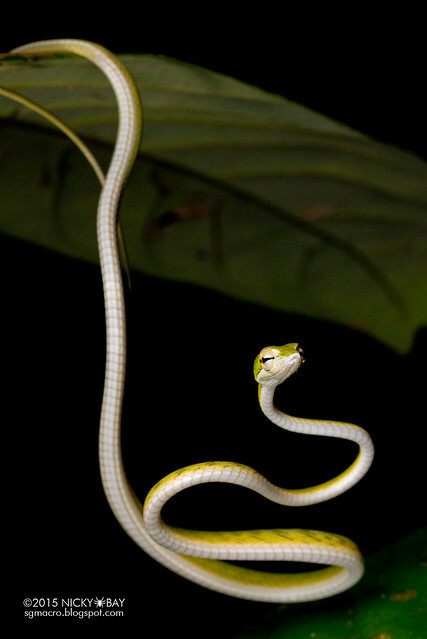 Back-lighting reveals the entire scene and the bulging eyes of the snake as well. 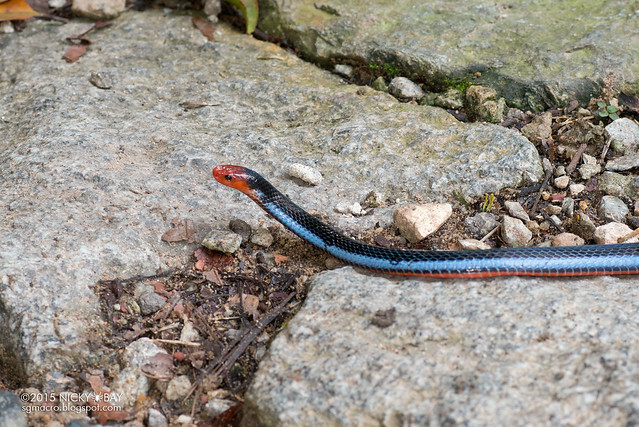 Just a quick record shot of the blue coral snake. 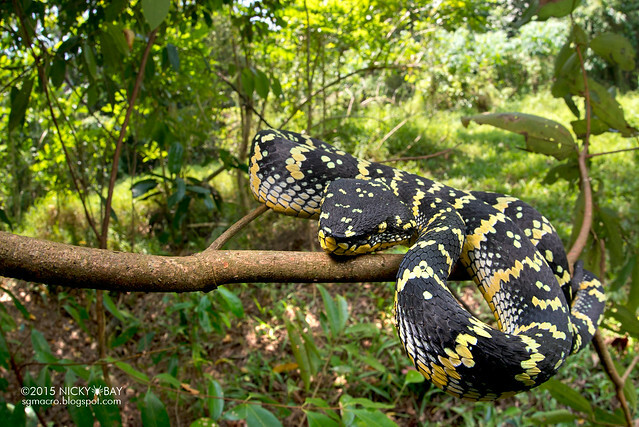 This snake has the world's longest venom glands, extending up to a third of the body from its fangs. We saw 2 of them together, but both escaped in different directions quickly when a large crowd of visitors spotted them as well. Found quietly sitting at the base of a tree while many joggers whisked past. Another beauty above our heads! A wide angle view including its habitat. Can't help including a close up of her head! 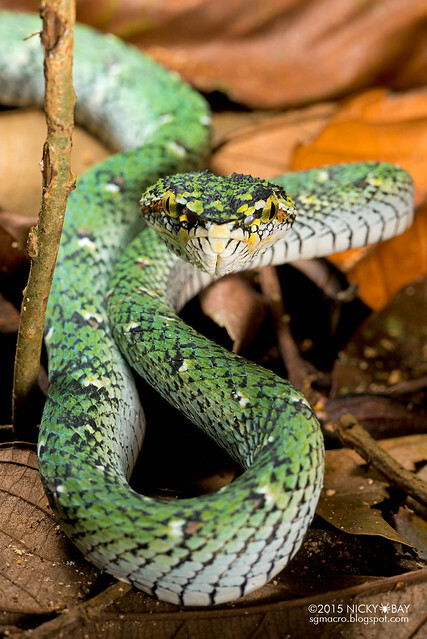 First time trying back-lighting on a snake. Not too exceptional unfortunately. 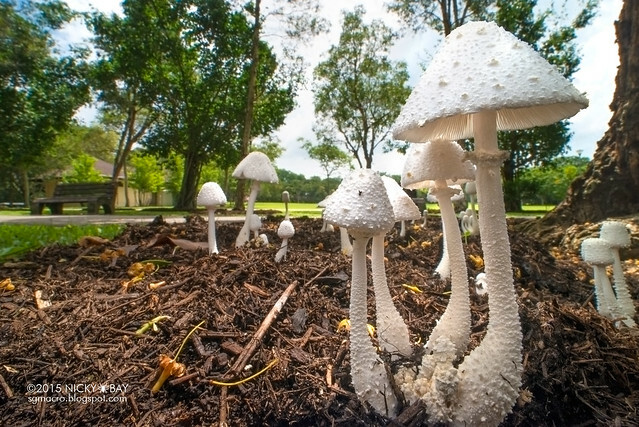 My largest bioluminescent mushroom cluster to date! 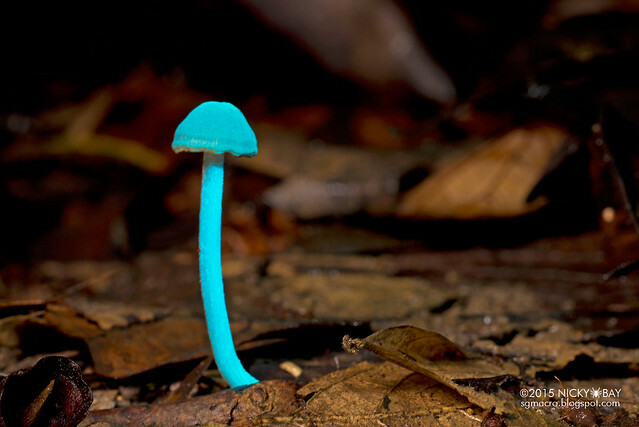 Interestingly, we also found a mushroom that fluoresces under ultraviolet. No idea what made the difference. Another test of the Venus 15mm wide angle macro lens. 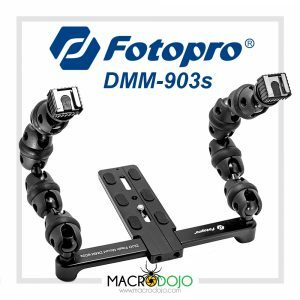 This was shot for a review of the wide angle macro lens mentioned above. Just a simple scene at the entrance of Pasir Ris Park. 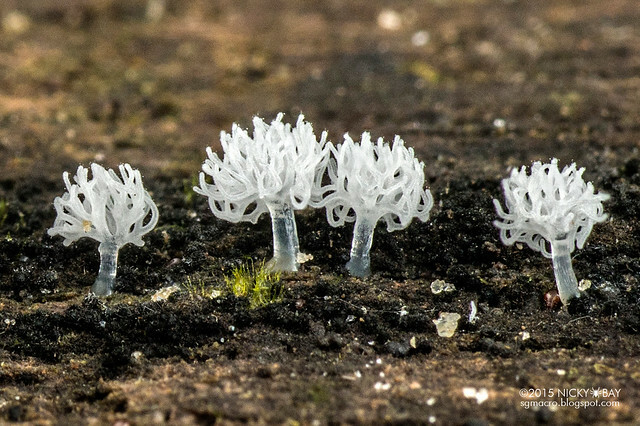 Not exactly fungi, but an interesting view at slime moulds up close. They look like mini trees! It wasn't easy at all to shortlist these photos for 2015 as I had such a long list to start with. I do have some of the best finds from Malaysia, Indonesia, Belize and Peru as well but I've already done comprehensive blog posts about those and thought doing one for Singapore would be apt as a closing post for the year. 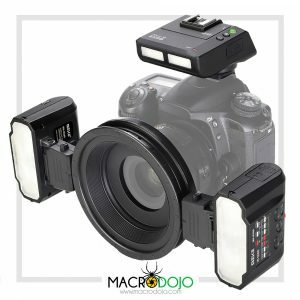 ;) In conclusion, 2015 saw many new and varied attempts at lighting the subjects, as well as new opportunities for wide angle macro with a new lens. I hope to have the opportunity to visit more exotic locations in 2016 and show more bizarre alien-world photos to everyone. Cheers to all, and have a splendid 2016! 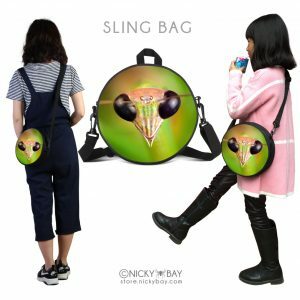 If you have any questions, please post in the comments below or contact me at nicky@bay.to.